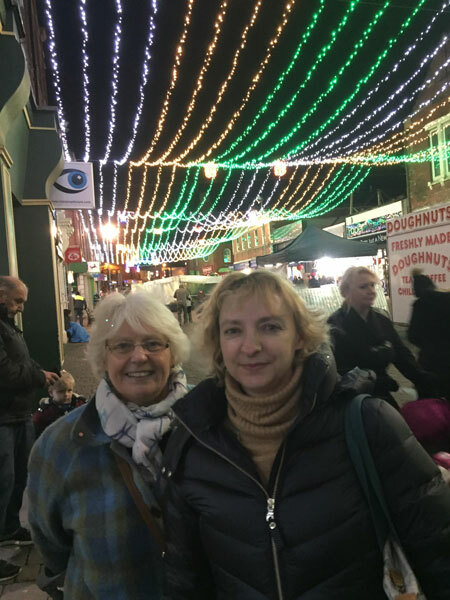 We enjoyed the lights switch on Tuesday night 28th November - WHAT A SHOW! Come and see the lights for yourselves and take a look at all that Castleford has to offer for Christmas. We also have some fabulous gifts in our Queen’s Mill Crafts market stall which are all hand made and some lovely arrangements that are made of wood from the actual Mill building itself. What a lovely keepsake for Castleford people! 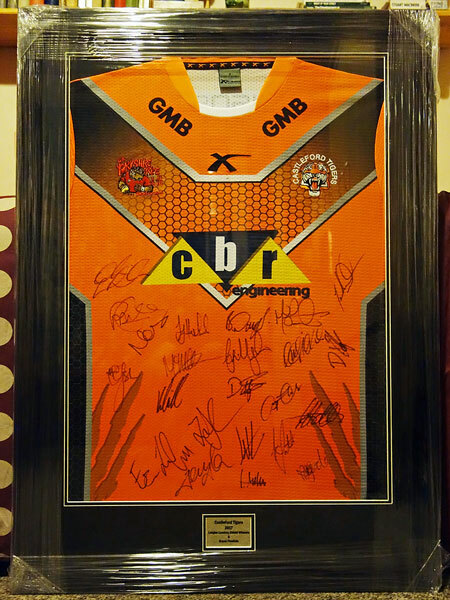 It has been decided to extend the selling period of the raffle tickets for the signed and framed Castleford Tigers shirt in order to raise additional funds for the work of the Trust. The winning ticket will now be drawn on Thursday 14th December and the number will be displayed at Queen's Mill Tearoom, Queen's Mill Crafts in Castleford Market and on the Trust's website, Facebook and Twitter pages. Check Facebook and Twitter @CasHeritage for news of further opportunities to buy a ticket prior to the above date. Queen's Mill Knit and Knatter group are to be featured in Simply Knitting Magazine - Issue 167 - which is due out on the 8th December 2017. We are excited to see the article which will detail all about the group and feature many of the amazing projects that they have done and continue to be involved in. If anyone is interested in joining the group everyone is welcome, the next meeting is on the 7th December at 1pm. Further information can be obtained through the CHT office on Tel: 01977 556741. At our next open day on Saturday the 25th Olsen Metal Art have created a sculpture out of the scrap metal from Queen's Mill which will be unveiled at 11am. We will be offering a variety of children's activities at our Christmas Open Day including - making tree decorations, window decorations, paper plate crafts and 2018 calendars. We are an official learning destination for the Children's University Scheme and children who are in the scheme (e.g. through their school) will be able to collect a passport entry for taking part. We want to create a new community room in the Mill. It would be great if the Aviva Community Fund would support this endeavour but we need your help. 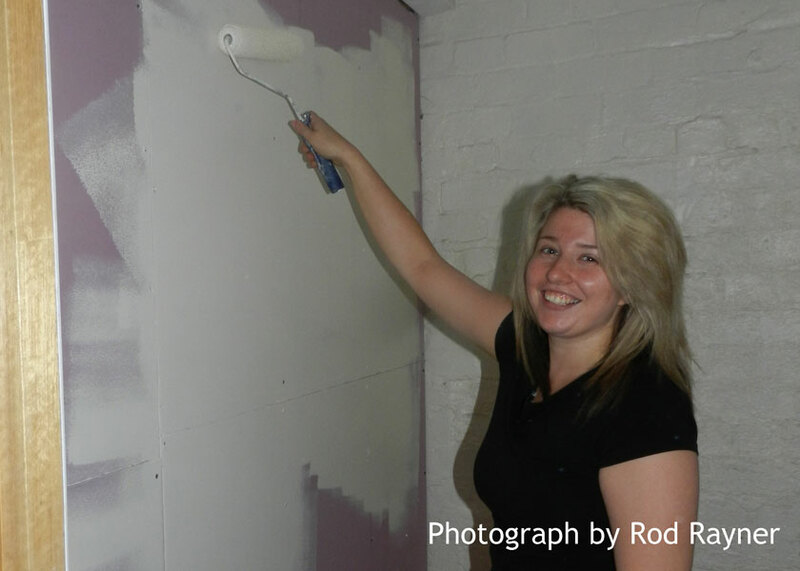 We currently run several community groups out of our premises at Queen's Mill on Aire Street, Castleford. These include Knit and Knatter, Quilting, Art Workshops and Trial Yoga Classes. 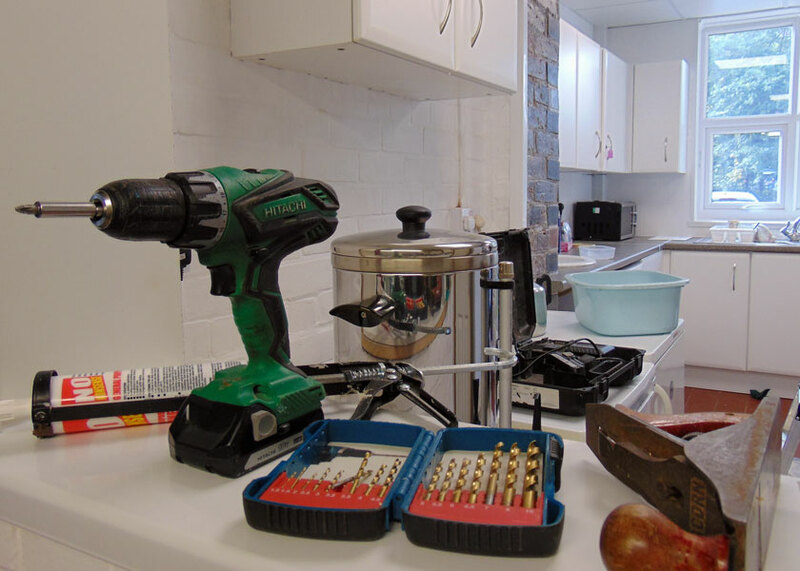 We also use our premises to facilitate community and corporate training courses. We would like to invest in creating a new dedicated space for these groups to work and to socialise in and to be able to extend what we have to offer for the local community. Our current meeting facilities are basic and do not offer all the facilities that the groups need. The current meeting room is used for many different purposes and this means that it is not always available for community use. So please follow this link and ‘log in or register’ to vote. Ramp up the slider bar to 10 and Vote for us! 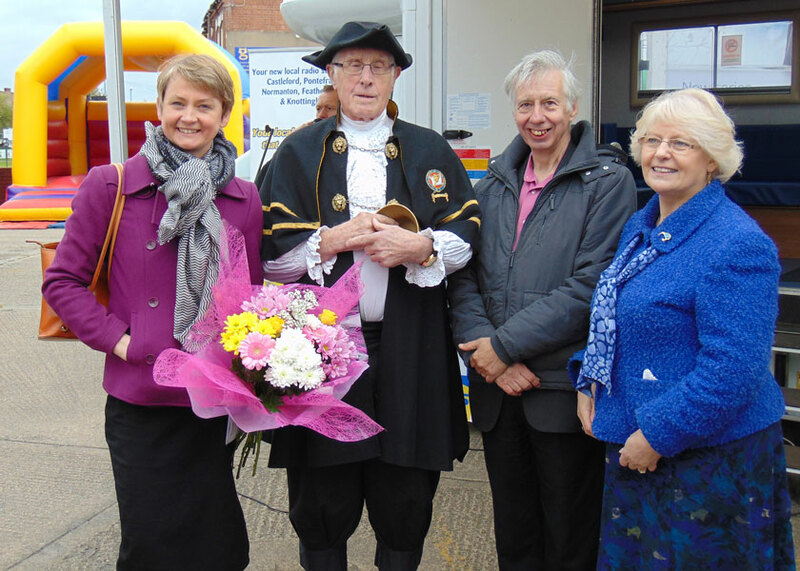 Castleford Heritage Trust president Yvette Cooper MP, opened the first part of the museum project based at the Queens Mill, Castleford. 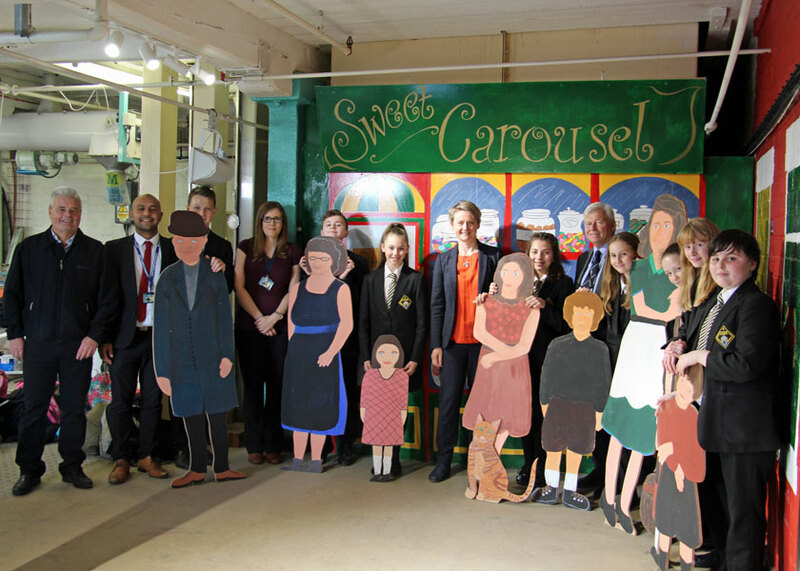 The street scene artwork known as Mill Terrace was designed and installed by pupils from Castleford Academy under the guidance of Diana Davies, head of art. Yvette took keen interest as the pupils explained the process and what inspired the artwork, before thanking them for all their hard work. CHT volunteer Kevin Lloyd, who invited the school, said "The pupils have done a fantastic job, and were a credit to themselves and the school, with many taking time out of the school holidays to work on the project. The trust would like to thank Castleford Academy headmaster George Panayiotou, Chair of governor's Bill Clift MBE with special thanks going to Diana Davies for their support"
Thanks to grants from Power to Change and Wakefield Council we are currently undertaking a significant refurbishment programme at Queen’s Mill. This will open up more areas of the mill for community and business use. On Friday 6th October we will be offering businesses and groups the opportunity for a sneak preview of our new facilities, which will be available for rental very soon. Whilst refurbishment is still on-going, visitors on the day will get an idea of the scale of work that is being undertaken, see some of the facilities which will be available, and get chance to talk about the possibility of Queen's Mill being the new home for their business or group. On the morning of 6th September 2017 we had a very special visit from Johan De Pont, Benthoed Moof and David Jones of The International Molinological Society. The guests enjoyed a detailed tour of Queen's Mill from our Head Miller Dave Weatherson, who made a special effort to come down to show them around. Local photographer Lee Crowther has sent us this picture of the mill, we particularly like the heron perching on the overhang. Lee tells us he took the picture on September 1st at approximately 20:40 just as the sun was setting. Thank you Lee we appreciate your support. Following on from their successful day at the Great Yorkshire Show volunteers Dave Pickersgill, Dave Weatherson and John Parker attended the producers day at Bert’s Barrow in Hillam on Sunday 13th of August. Having spent the previous day baking samples ranging from beer bread and cinnamon bread to peanut butter dog biscuits the trio spent an enjoyable afternoon promoting Queen’s Mill and Queen’s Mill flour. They again handed out Queen’s Mill information leaflets to the hundreds of people from around the district who stopped by their stand for a nibble and a chat. Tuesday August 1st 2017 didn't just mark Yorkshire Day here at the Mill it also marked the second anniversary of the Tea Rooms opening. 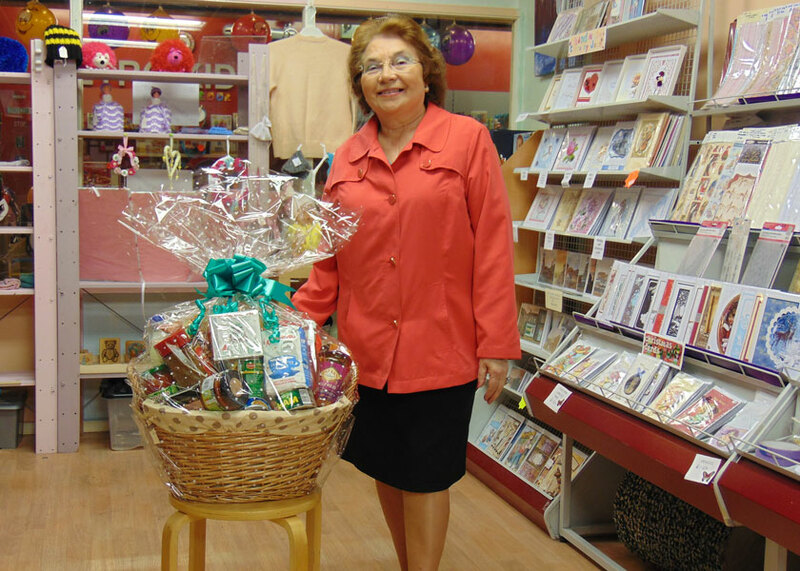 When asked to comment proprietress Dana Russell said, “Thank you to our wonderful customers who have supported us. You have been amazing. 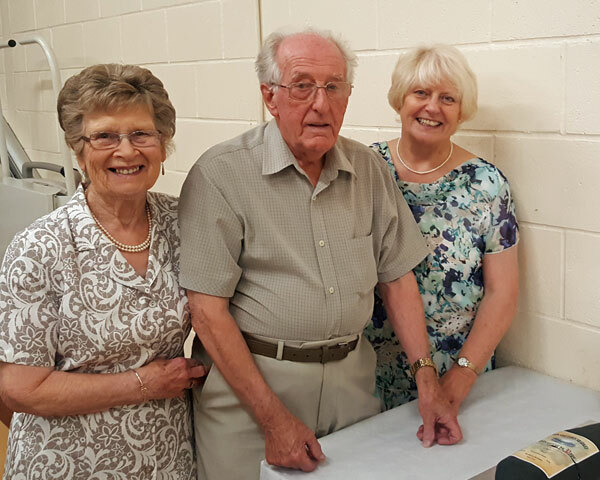 One of the Trust's longest serving volunteers, Jim Sharkey recently celebrated his 90th birthday. Jim worked hard for the Trust over the years, his late wife Gretta was a Trustee along with Marguerite Harvey from the early years of the Trust. They were great organisers of the Heritage Festival Fortnight when the Trust did hands on activities with local schools and staged exhibitions and events in the town. It is good to see Jim doing so well and enjoying life at 90. Best wishes to Jim and all the family who continue to support us. 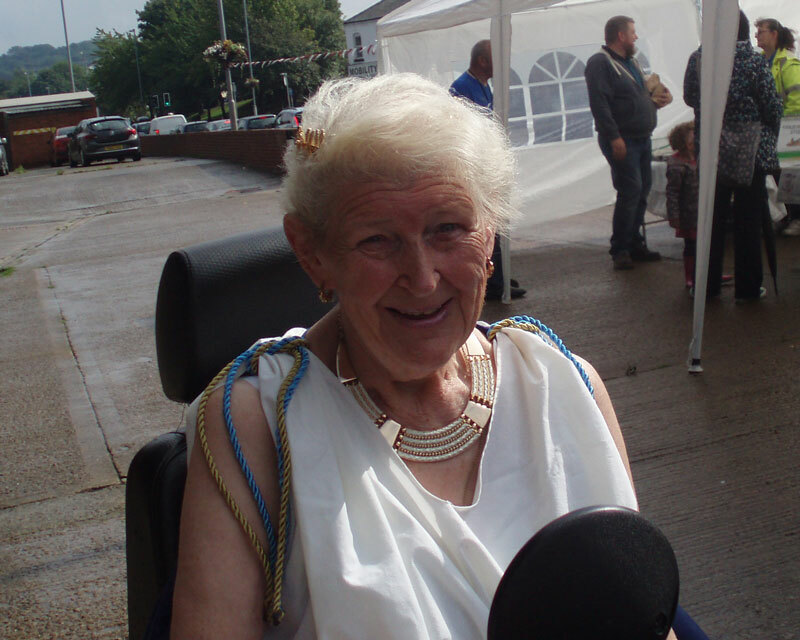 Marguerite, as lovely as ever, is still active at Trinity Church and comes to our Open Days and events. Thanks to all for continuing to be such loyal members and supporters. 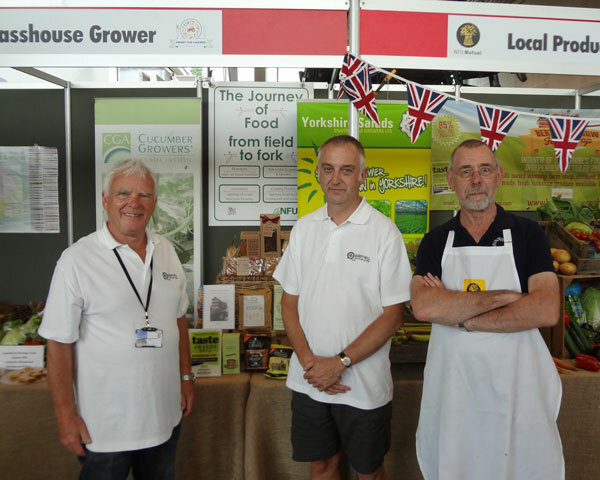 Volunteers John Parker, Dave Pickersgill and Dave Weatherson spent a highly successful day promoting Queen's Mill flour at the Great Yorkshire Show on Thursday 13th July. They had been invited by Hillam farm shop and flour stockist, Bert’s Barrow, to take charge of their stand in the Meet the Producer section of the show. Armed with boxes of samples baked from Castleford flour – John's parmesan biscuits and Yorkshire shortbread; Dave W's beer bread; Dave P's walnut & cinnamnon bread and raspberry & almond tea loaf – the trio enjoyed a hectic few hours extolling the virtues of the flour and explaining what is happening at the mill. They also handed out Queen's Mill information leaflets to the hundreds of people from around Yorkshire and beyond who stopped by the stand for a nibble and a chat. 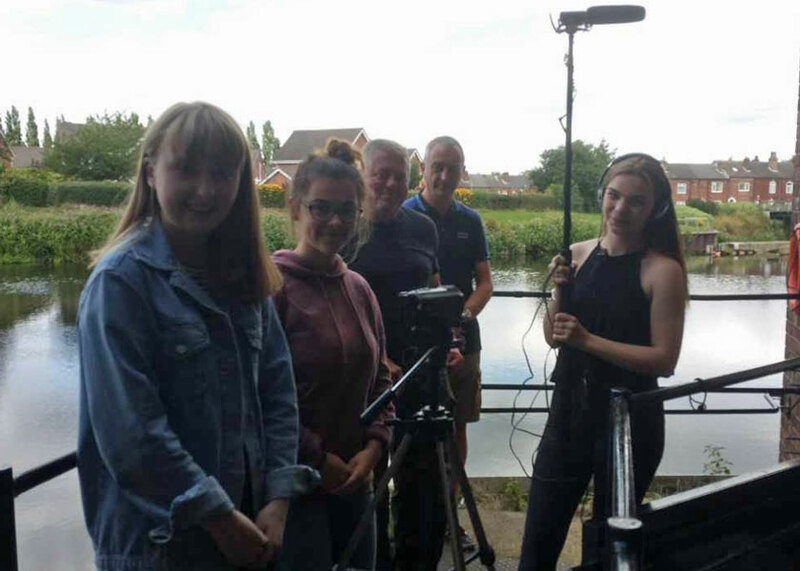 On 11th and 12th July 2017 Castleford Heritage Trust teamed up with the National Citizenship Service (NCS) to take part in filming a promotional video to showcase our projects, history and heritage. The visiting group of around 15 teenagers were on site for 2 hours each day, had a tour of the premises and were invited to explore the areas and questions that were meaningful to them. 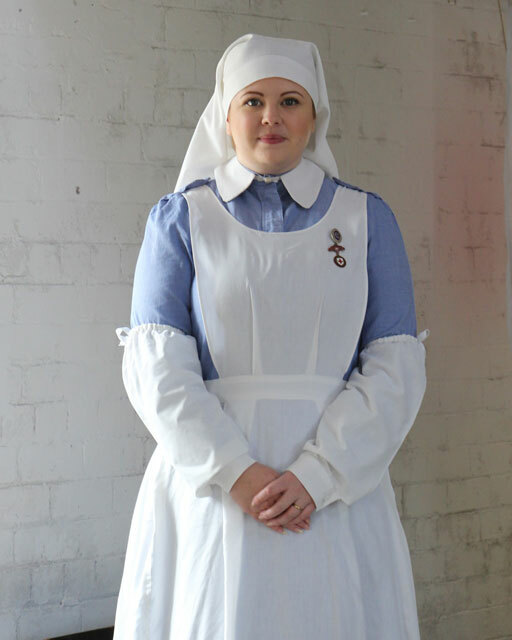 Many of our volunteers got in front of the camera to share our story and the filming took place around Queen's Mill and also in Castleford Market place at our shop. We really enjoyed being a part of this project and had a really entertaining two days. Thank you to everyone involved. We hope to be able to share the video on this website in the near future. 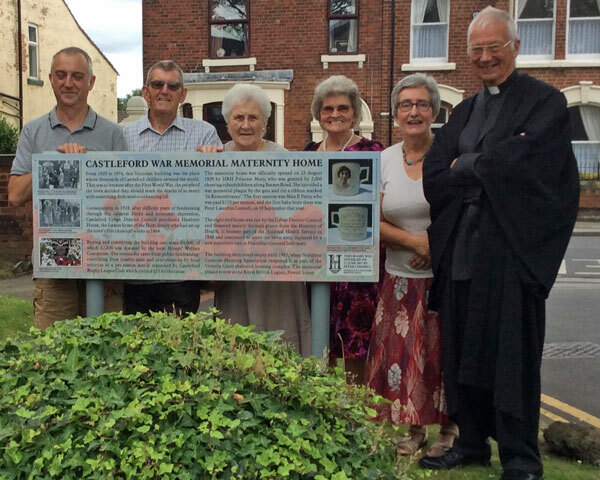 On Friday July 7th Peter Lascelles Connell unveiled the history board outside the former Maternity Home on Barnes Road, he was the first baby to be born at the home. David Pickersgill researched and designed the board and Revd. Laurence Turner said prayers of dedication. Children from Smawthorne Henry Moore, Half Acres and Park Junior schools attended and received an information leaflet telling the history and showing photographs of the original opening in 1929. 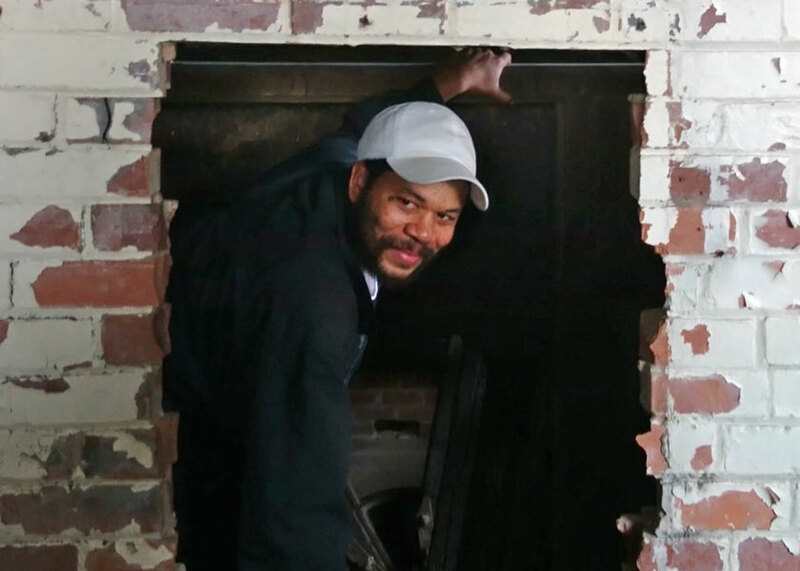 On the afternoon of Thursday 1st June internationally celebrated Colombian artist, Oscar Murillo, visiting Queen's Mill was 'blown away' by the work on the mill and the waterwheel and suggested ways of supporting the project. We're working on developing Oscar's Frequencies project in Castleford with local schools. This is a great opportunity and a real honour for our town, his huge success on the international arts scene at a young age is really impressive. We're looking forward to seeing you on a return visit Oscar. On Thursday May 11th we had a special visitor to the Mill, Laura Quinn. Laura is a Live Well Advisor – part of the new Live Well Wakefield service. Live Well advisors promote health and wellbeing in adults 18+ in the Wakefield District, by offering a referral based service. Advisors are able to meet with clients within their home or community setting, and discuss with them options available to support with maintaining their health and wellbeing. Our Chair, Alison Drake, had arranged for Laura to visit us to see what opportunities the Mill could offer. Laura was given a tour by one of our volunteers John Parker, during which Laura saw the work the volunteers had completed, including the community kitchen, the amenity block and Island Gallery on the ground flour. 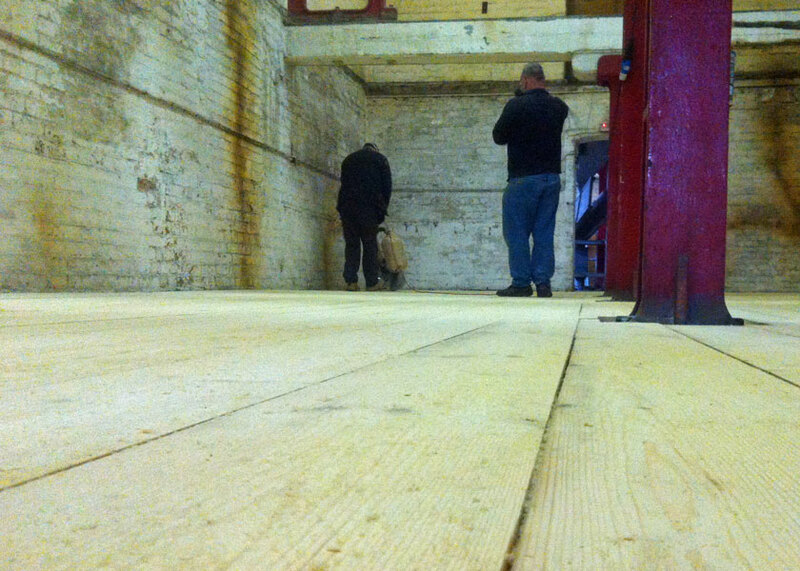 On the second floor she met some of the volunteers and saw the ongoing museum project taking shape, following on from this she was shown a video of the milling process by Dave our miller. Back to the ground floor Laura met the TEC team who are restoring the water wheel and it was here where she was given a glimpse of the interior of the wheel, a sight few people have seen. At the end of the tour Laura was presented with a copy of our recipe book Castleford Born & Bread and a sample of our flour. If you are interested in getting involved in activities in your local community but don’t know where to start or lack confidence in taking those first steps, our Live Well Team can discuss with you what you might be interested in and support you in taking those first steps. Laura’s visit to the Mill was to find out about the range of opportunities available to local people who are interested in trying something new within their local community. For more information contact the Live Well team on 01924 255363, or visit their website. 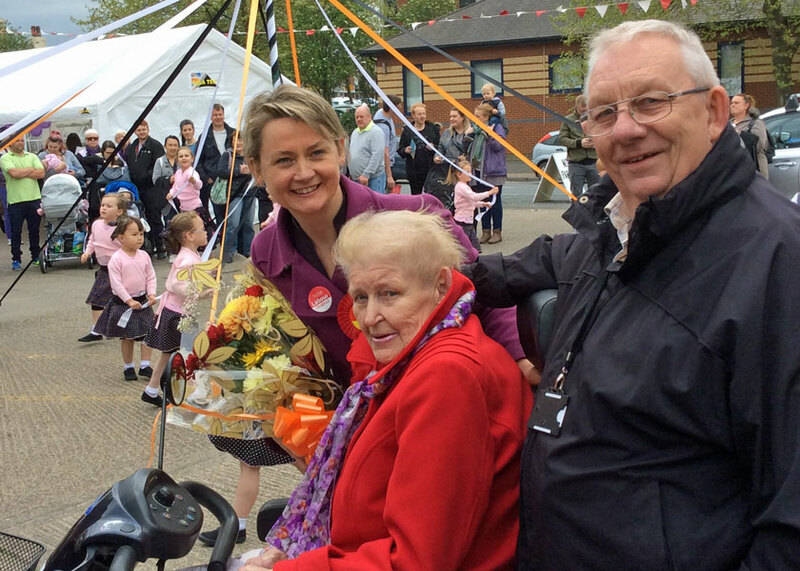 CHT President Yvette Cooper crowned the maypole at Queen's Mill Open Day. 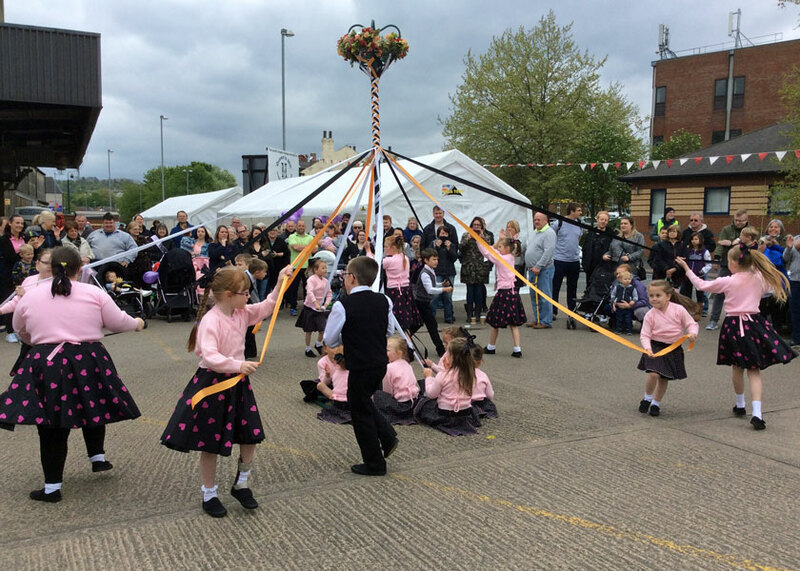 The Castleford Maypole Dance Group were perfect at plaiting the ribbons and Wendy Rayner came to watch with husband Rod, who helped to organise the event. Wendy made a special effort to be with us after a long illness. 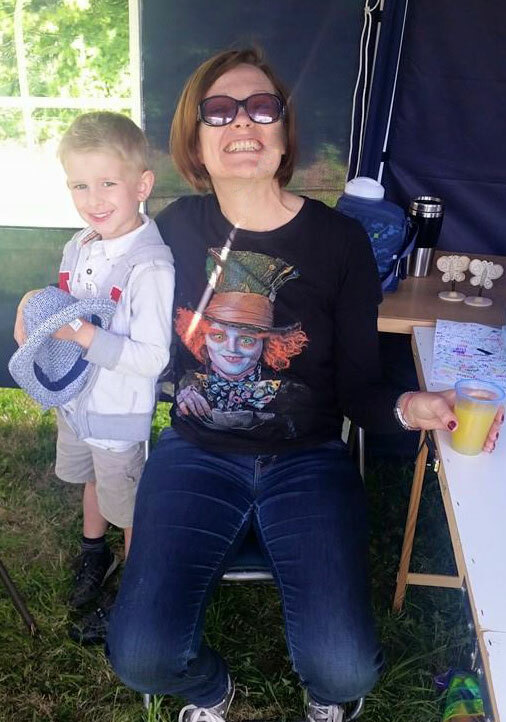 It was good to see you Wendy, we hope for a full recovery and look forward to seeing you at the Boat Festival next Saturday, 13th May, on the canal side, Lock Lane. There is a free introduction to Feel-Good Yoga at The Mill this month! 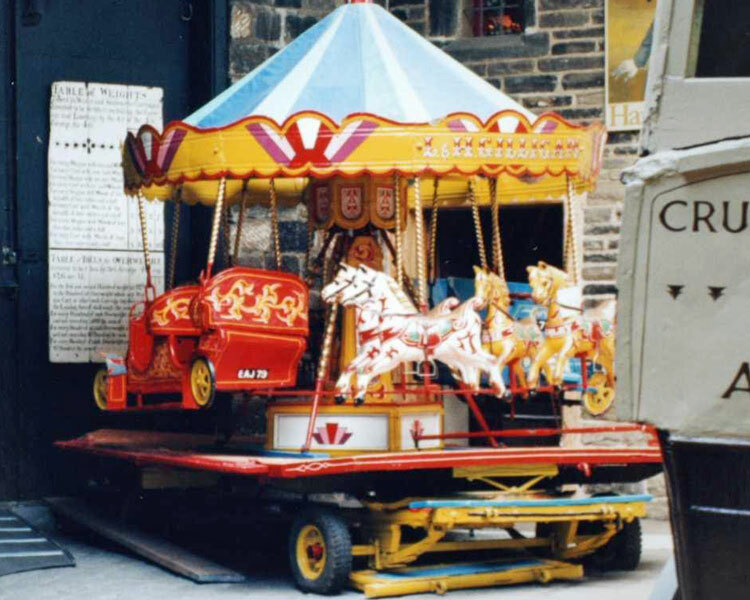 Castleford Neighbourhood Police have been in touch with the Chair of Castleford Heritage Trust this week about progress in tracking down the stolen carousel horses from our unique Gilligan’s Roundabout. 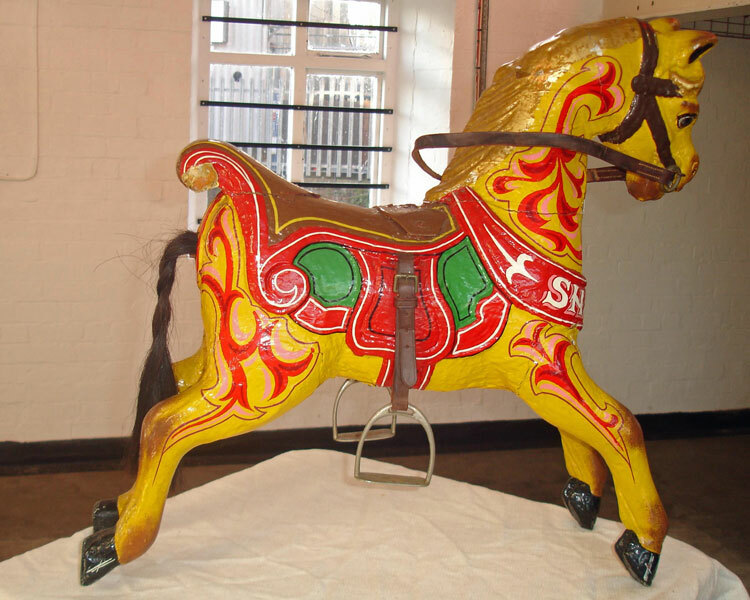 If you’ve lived in Castleford for a long time you may be interested to know we’ve seen one of the old carousel horses on the BBC2 programme Put your money where your mouth is. 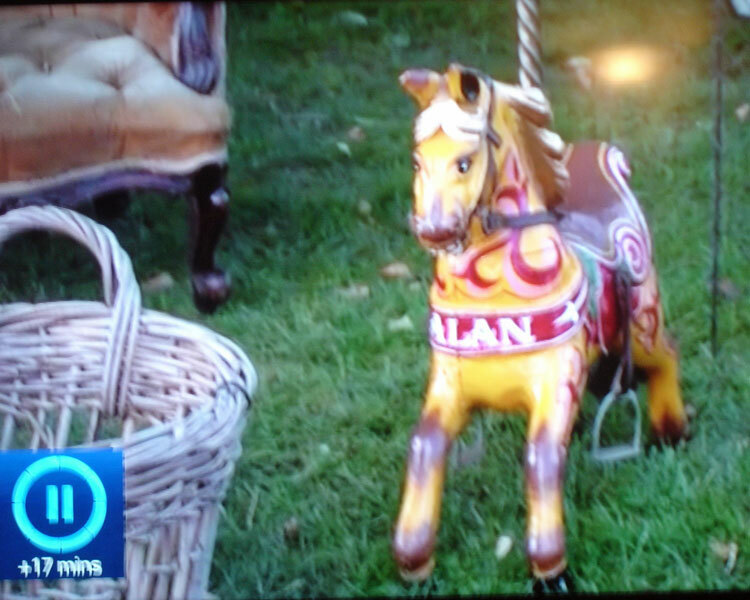 The lovely old horse ‘Alan’ was seen at an antiques fair in Sussex, so they have travelled a long way since we saw them last! The horses were stolen from Queen’s Mill in 2014 and West Yorkshire police have asked Sussex police force to help track them down and hopefully the thieves who stole them. 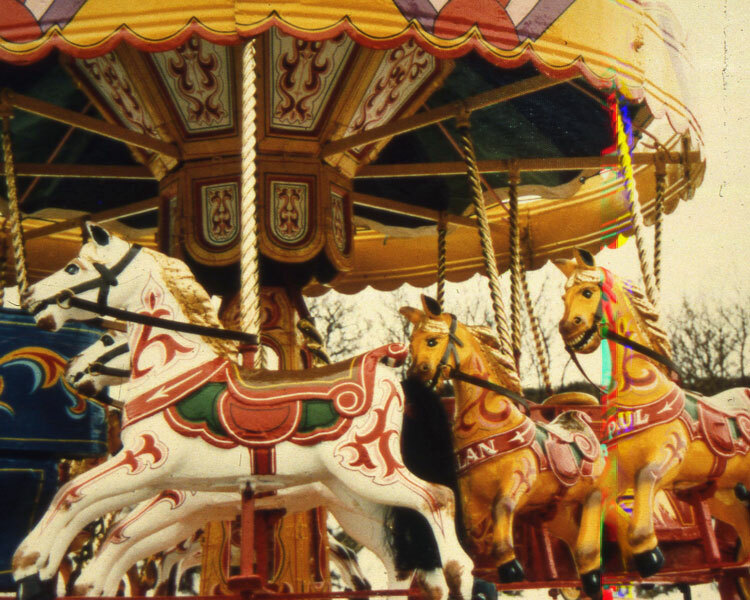 Our Police and Crime Commissioner, Mark Burns-Williamson, is a local lad and one of CHT’s Trustees, so he is keen to see the horses recovered so that we can continue to restore our much-loved Gilligan’s Roundabout. Big news at Queen's Mill tea rooms. As of Tuesday 2nd May the tearooms will be open six days a week. We will only close on Wednesday's. We look forward to seeing you all. Also we are soon to be getting an outside awning to provide shade in the hazy Castleford summer sunshine I'm sure we have coming soon. So outside seating, ideal for dog walkers and cyclists in need of refreshments. We have created a new page for the website entitled Mill Mixtures which highlights the work of the volunteers. 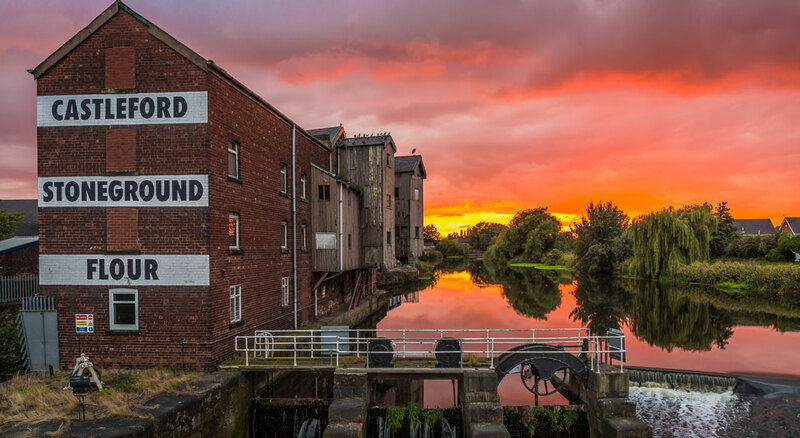 Castleford Born & Bread is a free festival celebrating the town of Castleford through words, music and art, taking place on Saturday May 20th in our historic Queen’s Mill. Writing Competition! As part of the festival we're inviting young people under 18 years old, to write 14 lines about their favourite people and places in Castleford, (either 14 sentences if it’s a description or short story or 14 lines if it’s a poem), to celebrate our wonderful town and the people who live here. All the entries will be displayed in Queen’s Mill on the 20th May, so the young writers (and everyone else who comes to the festival) can see their work displayed. The top 20 pieces that catch the judges’ eye will receive a ‘Castleford Born and Bread’ goody-bag of books and book tokens. 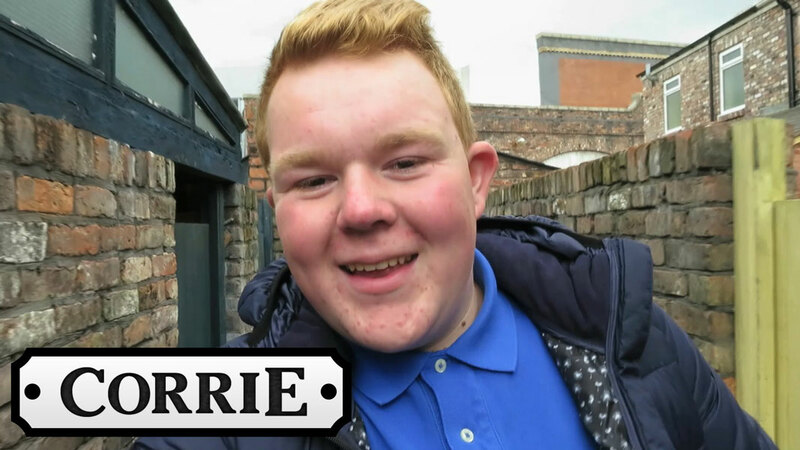 Their piece will also be read out loud to the audience on the day by Castleford actor Colson Smith – Craig Tinker from ITV’s Coronation Street! 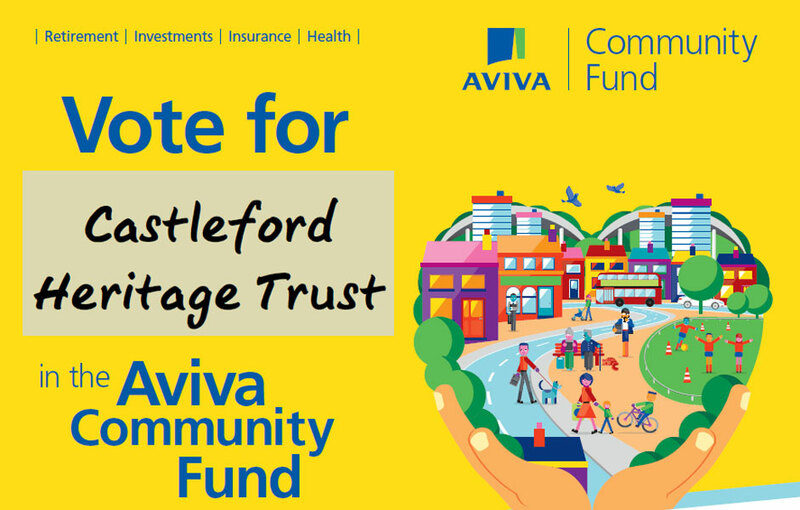 We’re hoping to get lots of short snapshots of what our young people are proud of about the town – the People, Places and History of Castleford: a Tigers home match, a local playground, Henry Moore, a favourite shop, a wonderful Grandpa or maybe even Diggerland! Anyone or anything that you want to tell the world about that’s in Castleford, and needs celebrating. For inspiration, come to the free Family Writing Workshop at Castleford Library on Tuesday 18th April at 10.00am. 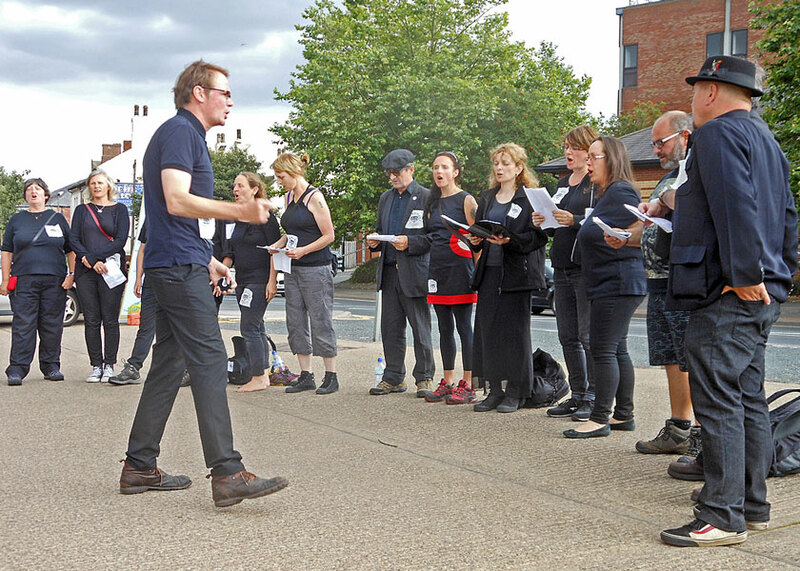 The festival is part of Wakefield Lit Fest's touring programme that co-curates a one day festival in different parts of Wakefield District. Organised by Beam and funded by Arts Council England Strategic Touring, in partnership with Castleford Heritage Trust. Beam combines creativity with practicality to help people make better places, with over 30 years’ experience in delivering creative places, through the development of collaborative arts projects, with communities and artists. Beam work with Artists and communities to enhance places through the development of bespoke creative arts projects. Beam is the trading name of Public Arts – an arts organisation and charity founded in 1986, based in Wakefield and working across the Yorkshire region and beyond. Watch this space for more announcements about Castleford Born and Bread festival on 20th May. Wilf & Esther Rhodes and Hazel Parks raised £150 from a tombola held at Carlton Lanes on Saturday, 11th March. We would like to thank all the people that supported us on that day. Also to thank all that gave the prizes. We are still collecting prizes for all open days. Thank you once again as we would not be able to do it without your support. On Saturday 11th of March a group of former Airedale School pupils will be visiting the National Arts Education Archive at the Yorkshire Sculpture Park. 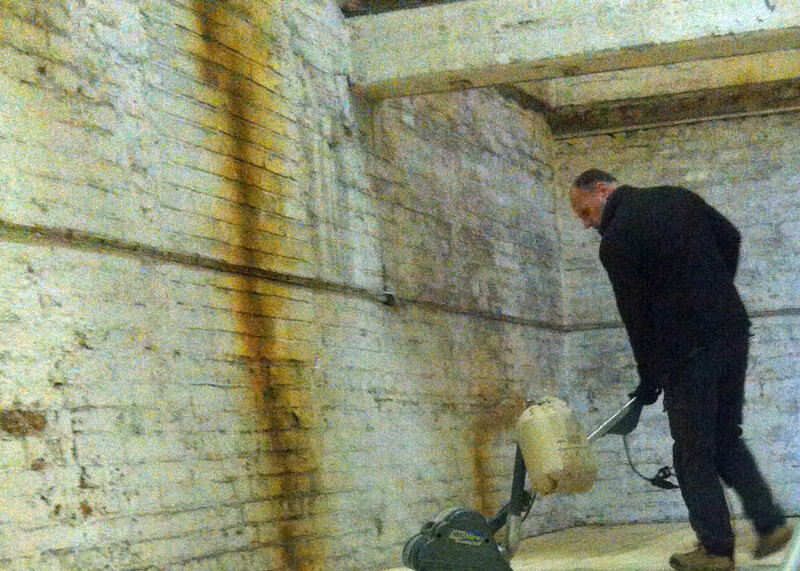 This will establish a group to help the Trust put together an exhibition for Queen's Mill. The exhibition will be a celebration of creativity and artwork from local schools in past decades, the Trust is hoping this work will be exhibited alongside work from pupils of today. The exhibition is planned for early 2018. Those who cannot attend can still take part by writing about their memories or contributing artwork they may have gone on to create in later life. Castleford Heritage Trust is delighted to announce it has been awarded almost £245,000 in funding from Power to Change. The grant will enable the Trust to carry out major capital works, and employ a Project Manager to manage the programme of works and support the Trust to become sustainable. The grant will fund the demolition of the large wheatstore at the eastern end of the site, and the demolition of the workshop building at the opposite side, to be followed by the construction of a wooden boathouse. It will also fund the refurbishment of three smaller rooms within the mill and the installation of a staircase and platform lift to give access to them. The Trust hopes to complete the works within 18 months and is currently recruiting for the Project Manager post. Power to Change is an independent charitable trust endowed with £150 million from the Big Lottery Fund to grow community business in England. Over ten years, we will provide funding and support to help build many more successful and sustainable local community businesses across England. 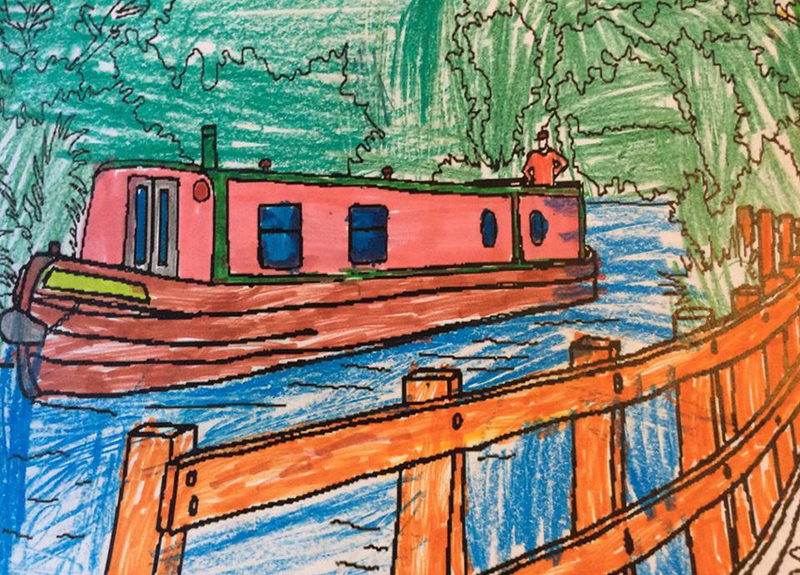 Although she has painted all her life, Hazel only got into her stride as an artist after retiring from passing on her love of art to generations of Castleford primary school pupils. 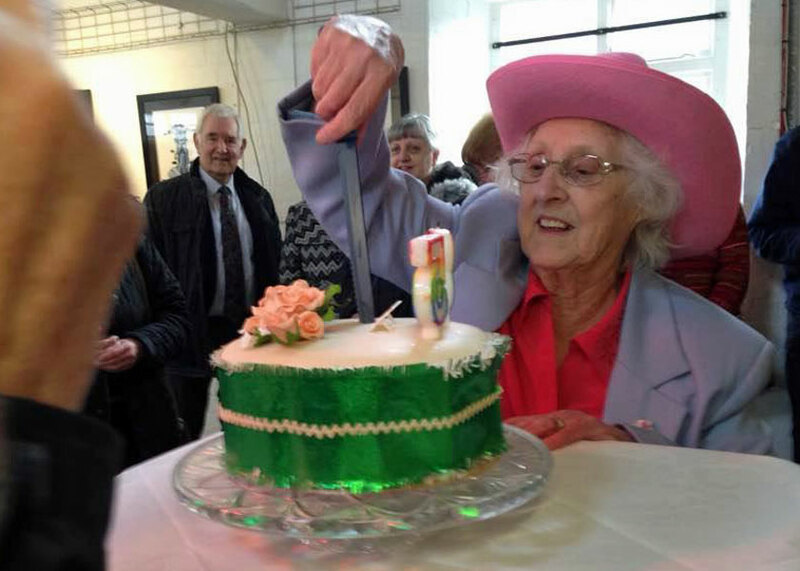 She marked her 80th birthday by completing a two-year art and design course at Wakefield College. “Hats & Heads, Bikes & Boats” is open Thursdays to Saturdays, from noon to 3pm, during February. Admission is free. 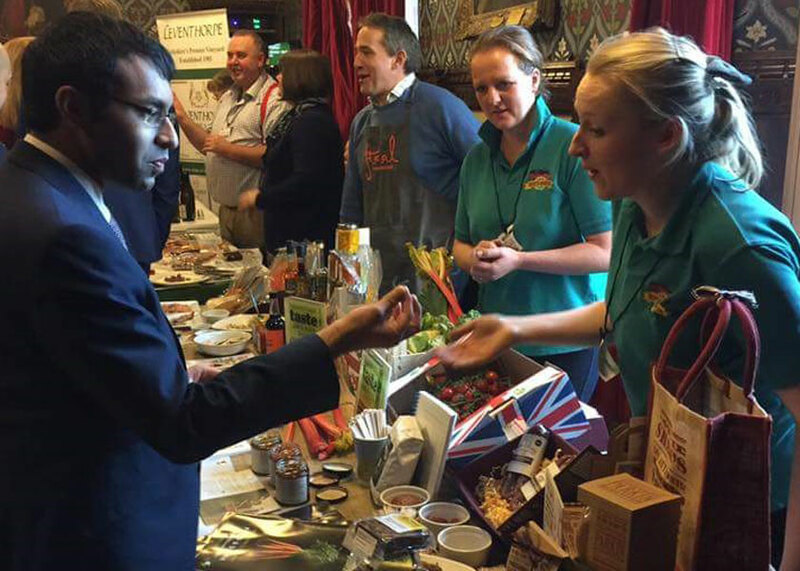 On Wednesday January 18th the folk from Bert's Barrow took a selection of Yorkshire produce to the Houses of Parliament as part of the Elmet Kingdom Food Day. If you look at the picture you will see our flour and John Parker's recipe book nestling in front of a box of tomatoes. If you want to know the answers to the quiz just click the icon. Throughout January the Glasshoughton ASDA store will have an ASDA Foundation box dedicated to the Trust. 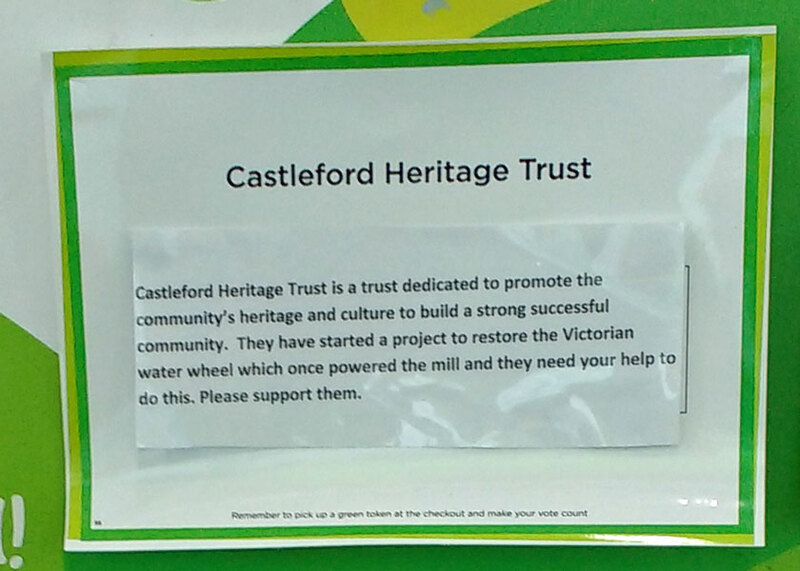 If you ask at the checkout for a green token you can deposit your token into the Trust box and help raise funds towards restoring the water wheel at Queen’s Mill. This is the most ambitious project we have so far undertaken and it will benefit the whole of the Castleford area and beyond. We therefore ask you to support our project and ask for a green token at the checkout. On Saturday November 26th over 500 people attended an open day at Queen's Mill which not only raised money for the Trust but also made visitors aware of the scale of the planned renovations for the site. 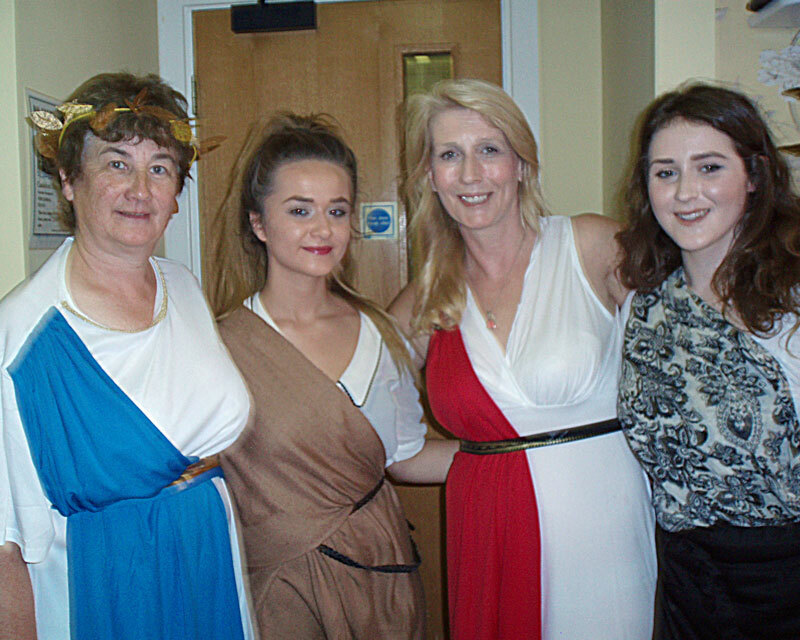 Trust Chair, Alison Drake said: "It was a wonderful success. We were amazed by the number of people that turned up. We had more than 200 people on guided tours around the mill and everyone seemed pleased with our plans. I think it shows the town are staying with us in terms of what we want to do and that means an awful lot to us." 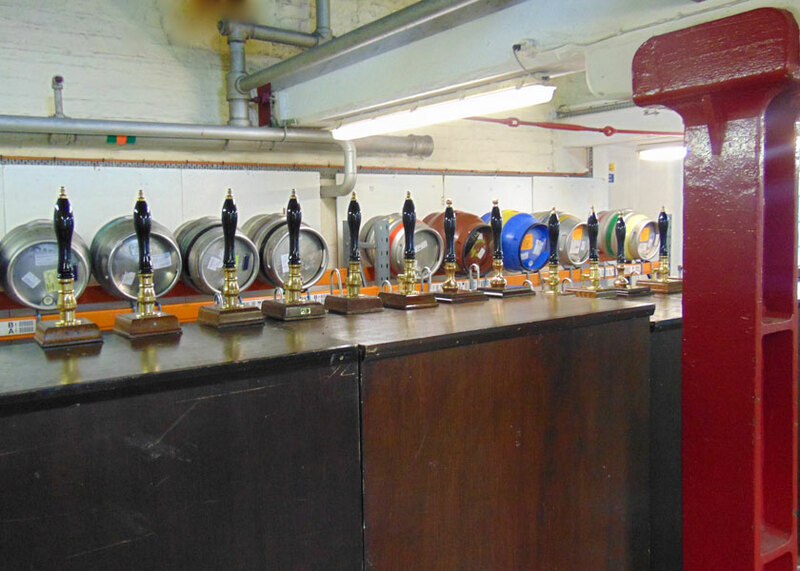 Friday 4th November saw the launch of the second Castleford Beer Festival which was held at Queen's Mill. 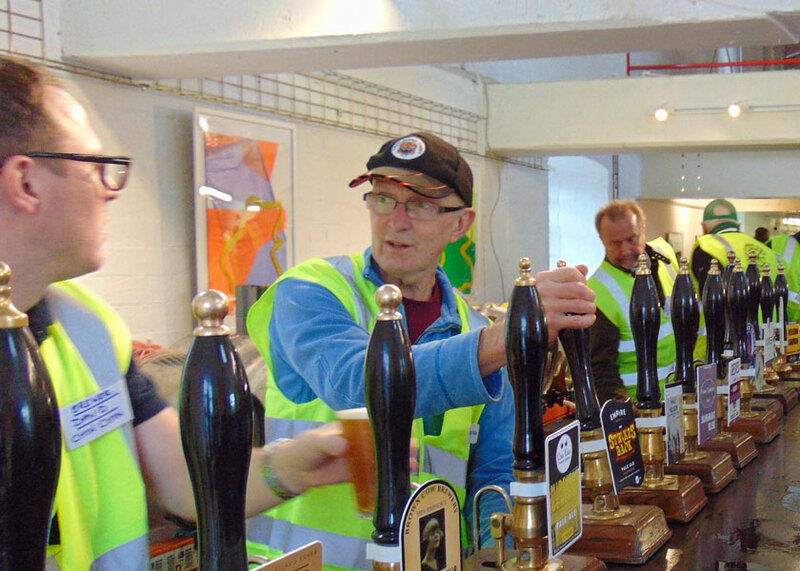 The event where over 500 visitors enjoyed sampling the 30 beers on offer was jointly organised by the Trust and Revolutions Brewery in Whitwood. On Friday the 7th of October the Trust hosted a preview of their first exhibition of Henry Moore artwork displayed in the Island Gallery. Guests were given the chance to view a selection of work by Moore and also the late American artist Robert Glade. The items were all loaned by their owner Susan Worthington who was the guest of honour at the event. The works by Moore featured a series of collotypes which came about when Moore joined Londoners who were sheltering from the Blitz in Belsize Park underground train station. At that time in 1940 Moore's studio in Hampstead was out of action due to bomb damage, the sketches were subsequently seen by Kenneth Clark, director of the National Gallery who persuaded Moore to become an official war artist. Robert Glade (1926-2015) grew up in the mid-west during America's Depression and moved to Chicago in the 1950's to join the beat poets and musicians in ‘the windy city’. It was in the early 1960's when Glade met Castleford born Sandra Worthington who was working as a teacher, they moved into an appartment together and in 1966 became engaged. In 1968 Sandra brought Glade to Europe where they toured the art galleries of capital cities, during this time Glade also visited Castleford where Sandra's father, a miner, took him crown green bowling in Queen's Park. From this point on Glade became an arts dealer and collector amassing a great collection of works which included the Henry Moore collotypes. On his death he bequeathed the collotypes to Sandra who has allowed the exhibition to take place. During the event a series of speeches were given by Trust Chair Alison Drake, Sandra Worthington and local MP Yvette Cooper. Following the speeches the exhibition was officially opened by guest of honour Sandra Worthington cutting a celebration cake donated by Eleanor and Emma Cawthra who run artisan bakery BakeMyDay on Smawthorne Lane. The exhibition is open to members of the public from October 8th to October 28th ample parking is available. On Friday the 16th of September repesentatives from charities magazine Give Local were given a guided tour of the Mill by Trust volunteer Rod Rayner. The party visited on the same day The Canal and River Trust completed the installation of the stop logs which need to be in place before the water wheel can be restored. The picture on the left shows the party along with Chair Alison Drake watching as three one ton weights which keep the stop logs in place are secured to the structure. A short video showing the stop logs going into place can be seen by clicking here. At the end of the tour the tour party presented Alison with a cheque for £200 which will go towards the hire fees for the weights. An article on the Mill will feature in a future edition of Give Local. On Wednesday 2nd November a local Yoga teacher is offering people the chance to try Feel-Good Yoga for free. An hour long introductory session will be held at Queen's Mill beginning at 19:30. Feel-Good Yoga is suitable for men and women, all ages and abilities. Further details can be seen by visiting Marie's website www.castleford-yoga.co.uk where you can book your place. 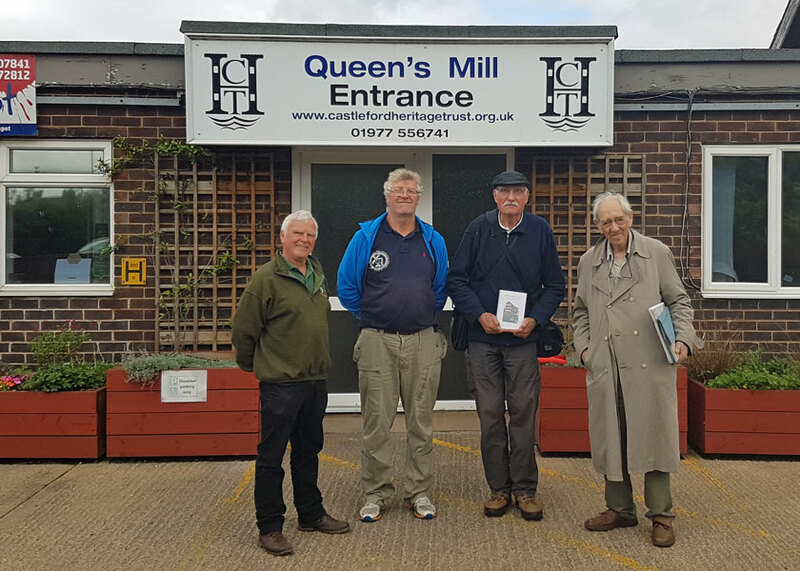 A chance visit to Queen's Mill Tea Rooms by Liz Bankhead led the Trust to receive a copy of the Flour Milling & Baking Research Association Bulletin from 1970. On page 17 of the journal is scientific research undertaken by E. E. McDermott and E. Bankhead (Liz), into the heat treatment of wheat and wholemeal for the inactivation of alpha-amylase. 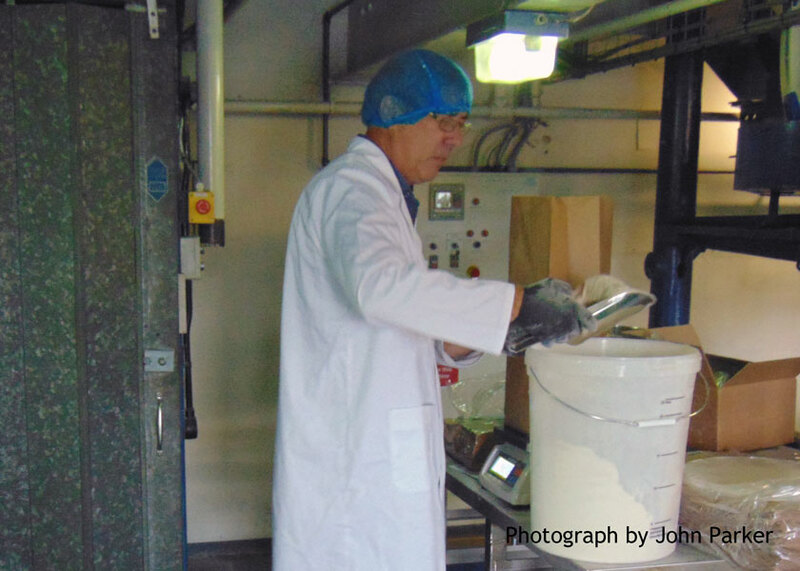 The journal is currently with volunteer John Parker who said, “It’s fantastic to have met someone who worked at the FMBRA, the centre that gave us 'The Chorleywood Process' which revolutionised bread making in the early 1960’s”. Liz is pictured presenting the journal to the Chair of Trustees Alison Drake MBE. First prize (bottle of Drambuie): Angela Cresswell, Allerton Bywater, 37/40 (gave both alternatives for question 32). Second prize (£25 Queen’s Mill Tearoom voucher): Pat Longbottom, Featherstone, 37/40 (gave one alternative for question 32). Third prize (bottle of Champagne): Brian Percival, Knottingley, 36/40. Fifth prize (bottle of whisky): Steve Yates, Castleford, 31/40. If you want to know the answers just click the icon. 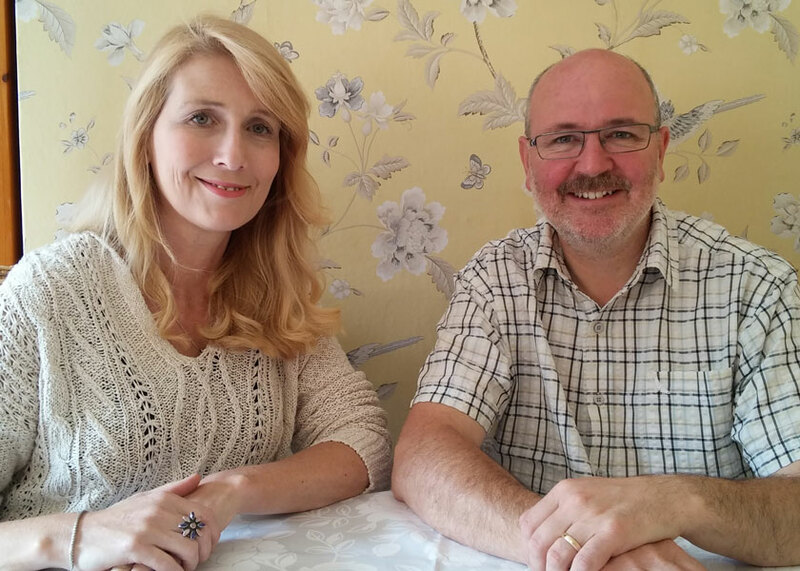 On Monday August 1st the tea rooms celebrated their first anniversary. Owner Dana Russell said “ It has been amazing and very rewarding working at the heritage site, watching it develop and grow. I have made some great friends and been supported by a lovely team of staff. The feedback we have received speaks for itself. On Saturday 9th July at our last open day we launched our new quiz to raise money to restore Gilligan's Roundabout. The quiz contains forty questions to test your knowledge of Yorkshire and was written in such a way as to make it difficult to find the answer using your favourite internet search engine. Contestants will have until the end of August to return their entries to collection boxes sited at The Trust Craft Shop and in Queen's Mill Tea Rooms. 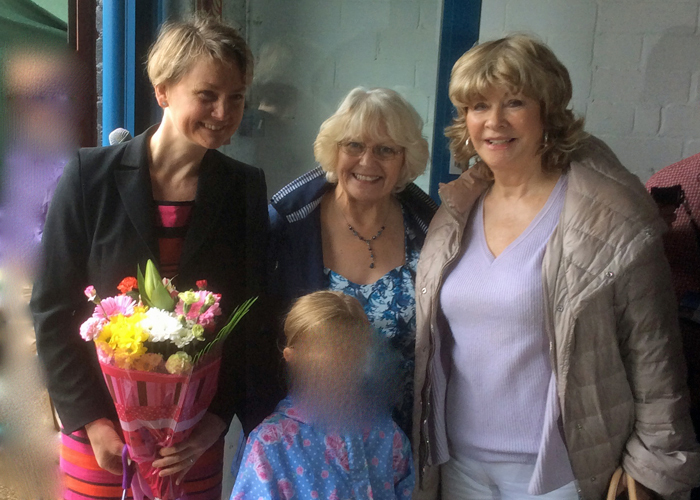 At our July Open Day the new entrance doors were officially opened by Yvette Cooper MP and Coun. Denise Jeffery with Chair of CHT Alison Drake. 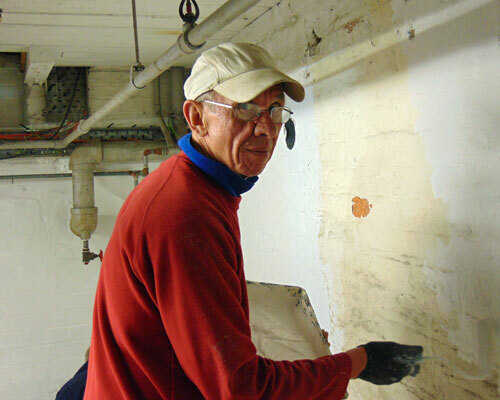 Volunteers are busy working alongside local contractors to refurbish part of the mill with the grant from WREN. 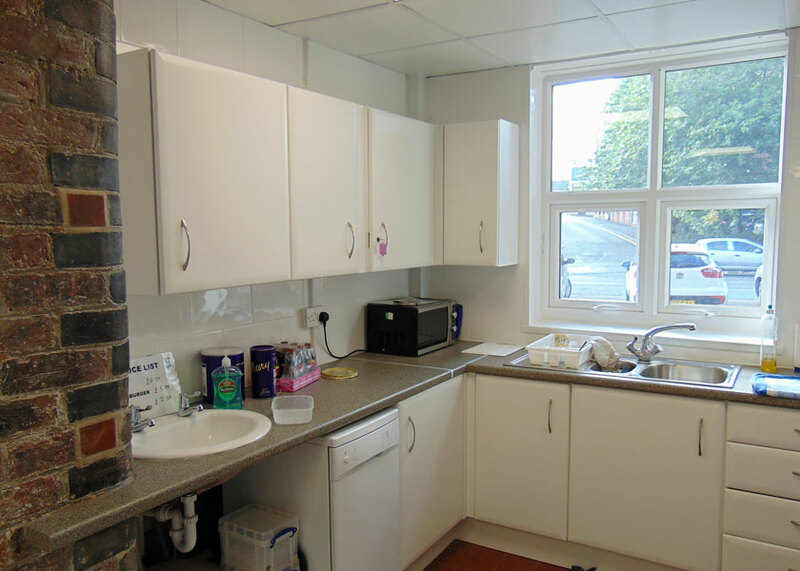 The project will provide a kitchen and toilets and open up more of the building for community use and is expected to be fully complete in the autumn. 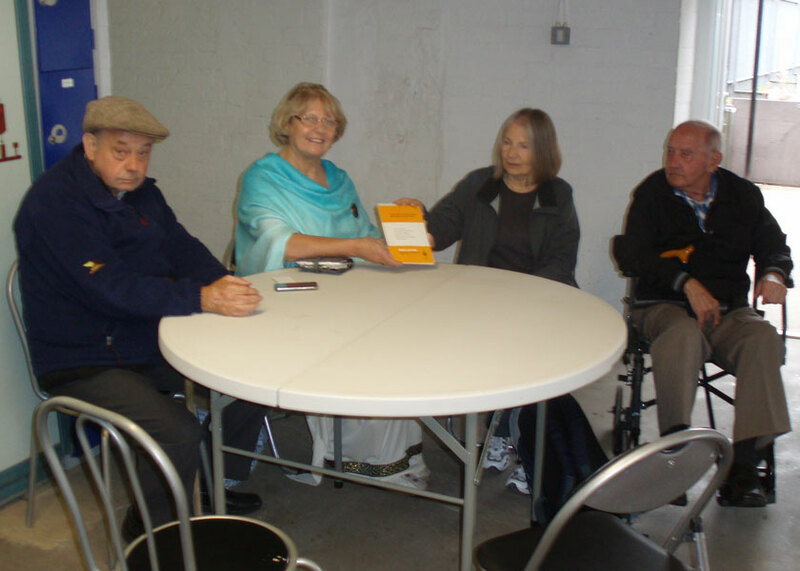 On Friday 17th of June Trust volunteers John Parker and Dave Weatherson gave a talk to promote Castleford Born & Bread, a book of recipes suitable to use with the flour produced at Queen's Mill. The talk was part of a joint initiative between the Trust and Friends of Castleford Library. The book which was compiled by John has a range of recipes for beginners and more adventurous cooks. 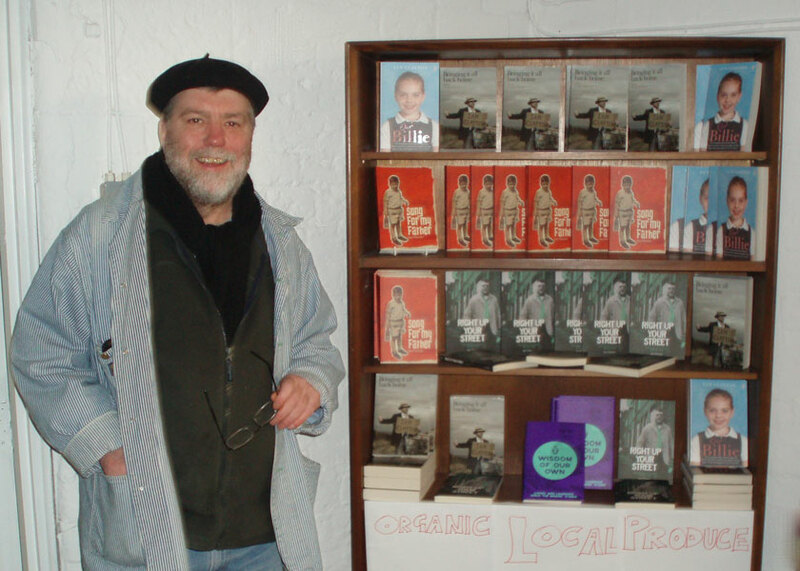 It has contributions by his fellow volunteers Delia Perrett and Dave Weatherson, along with a recipe from Yvette Cooper MP and one from her husband Ed Balls. 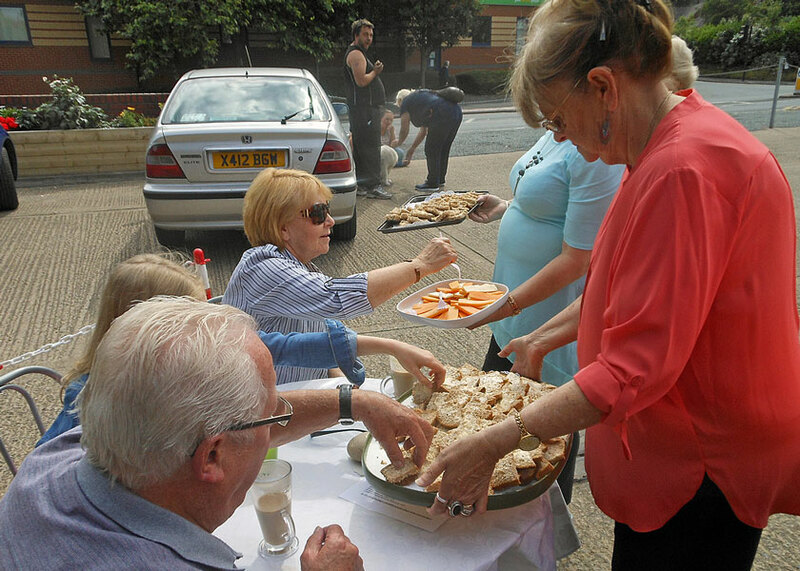 The talk started at 10:00 and attendees had the opportunity to sample biscuits baked by John and bread baked by Dave. 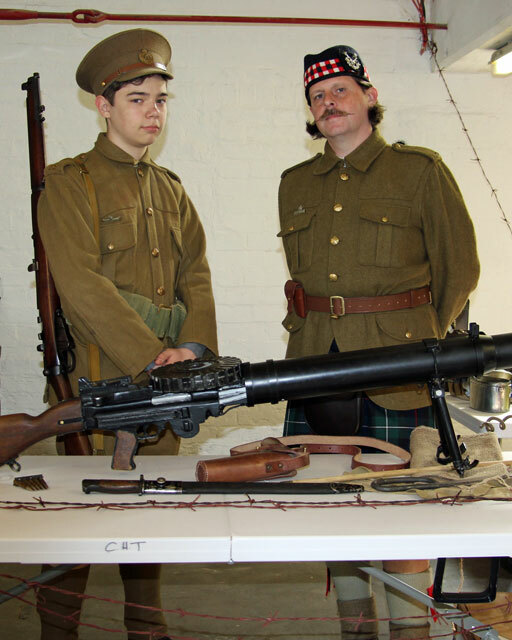 On Monday 16th May two gentlemen called into the Mill with this photograph and the accompanying text. One of them was the man in the photo, so he obviously survived the experience! 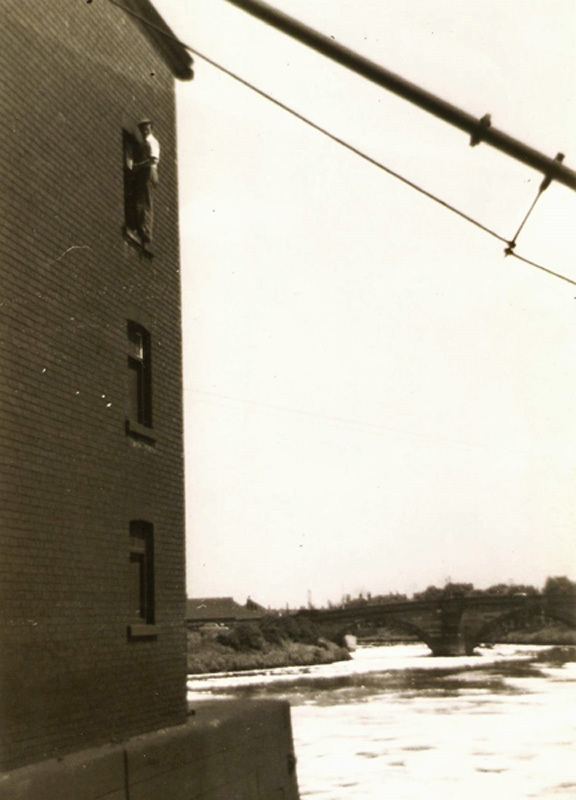 Tom Johnson glazing the uppermost window located above the wheel race at Allinson’s Flour Mill around 1954. Tom was employed by HH Clarkson Plumber and Glazier, Albion Street, Castleford. The photograph was taken by Keith Lunn, who was an apprentice. Tom fastened himself with a binding strap tied on the inside of the building, climbed out onto the window ledge, and re-glazed the window. No concern for health and safety. Blue skies and warm weather boosted the attendance when the Trust held its first open day of the year on Saturday May 7th. Those who attended were entertained with a display of Maypole dancing, also on show were a collection of classic cars, WW1 re-enactors The Time Tarts, birds of prey, craft stalls and mill tours. The event also marked the official launch of “Castleford Born & Bread”, a collection of recipes compiled by Trust volunteer John Parker. 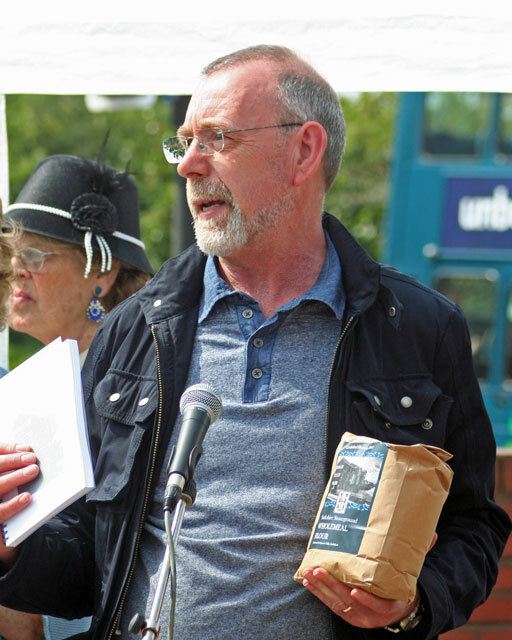 The book was specially written to complement the stoneground wholewheat flour which is milled on site, as well as the recipes the book contains an overview of the Trust, a history of the Mill and photographs by volunteer Rod Rayner. The book which sells at £6.99 can be bought at the Trust shop in Castleford Market or from The Queen’s Mill Tea Rooms and Bake My Day on Smawthorne Lane. In early April a group of volunteers dug a trench to install a sewerage pipe for a new amenity block. The resulting spoil from the dig was of great interest to Trust volunteer and local historian David Pickersgill. The artefacts found give an insight to the 19th century history of Queen’s Mill and the industrial heritage of Castleford. Click the icon to view David’s report. On Tuesday 5th July a local Yoga teacher is offering people the chance to try Feel-Good Yoga for free. 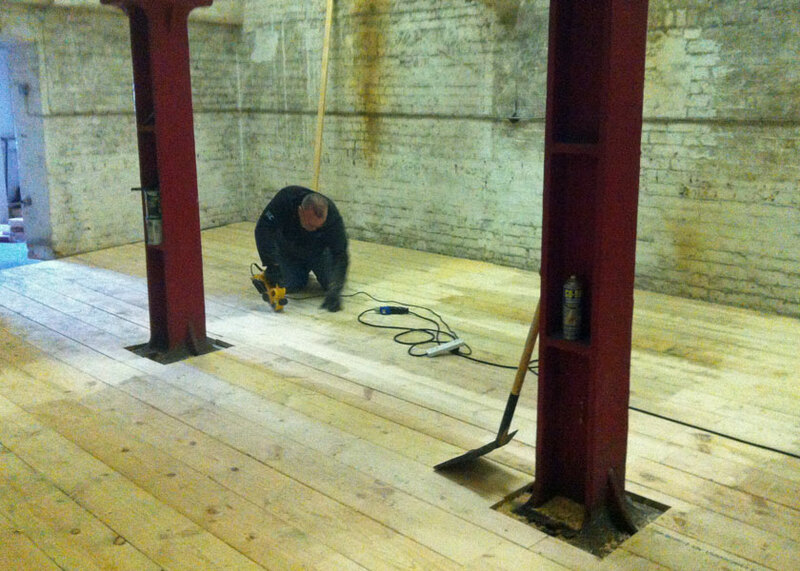 An hour long introductory session will be held at Queen's Mill beginning at 20:30. Feel-Good Yoga is suitable for men and women, all ages and abilities. Further details can be seen by clicking the thumbnail or by visiting Marie's website www.castleford-yoga.co.uk where you can book your place. More of Queen's Mill has been made accessible and available for use by the community in Castleford thanks to a recent grant by WREN. 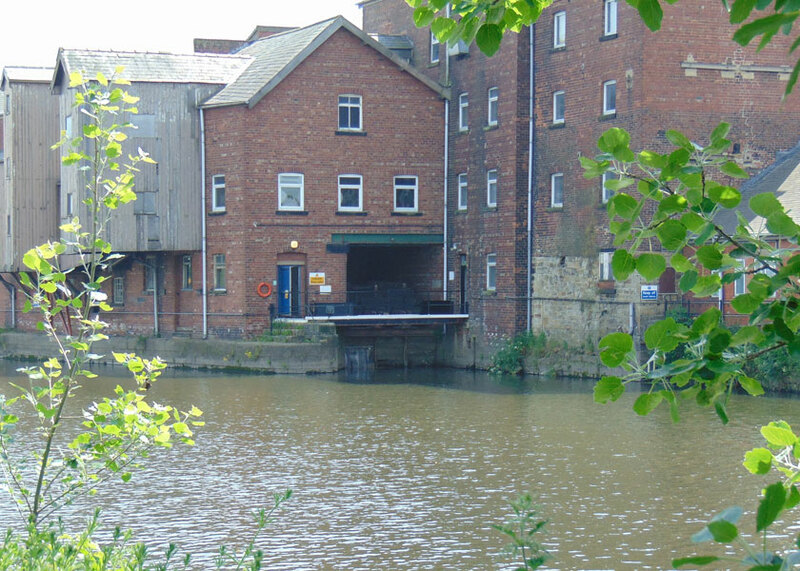 Castleford Heritage Trust applied to WREN for a grant to refurbish part of Queen's Mill and as the work progresses more of the building can now be used for events, workshops and other community activities. 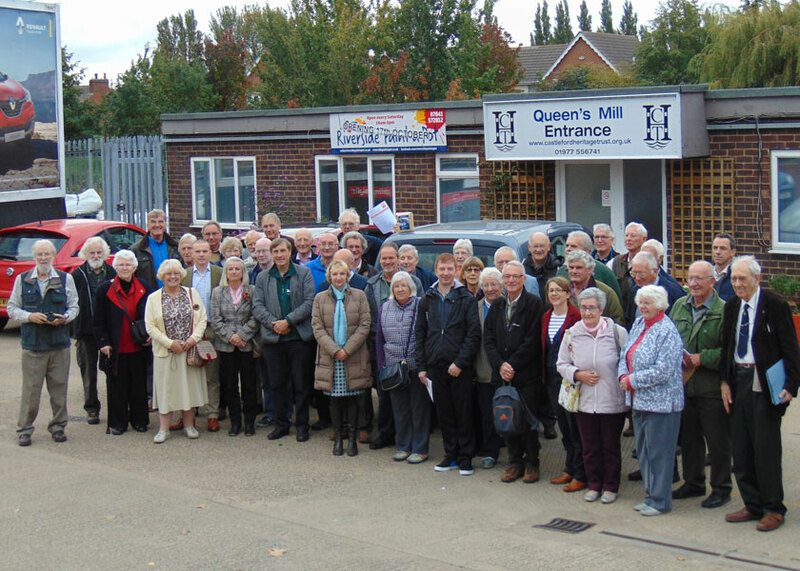 The Queen's Mill is now run as a Community Anchor providing a wide variety of support services, workshops, training and volunteering opportunities which are well attended and valued by local people. The Castleford Community Partnership (CCP) meets at the Mill on the 1st Wednesday of every month and the group representatives have voiced their appreciation of the work that is being done by volunteers and contractors to make Queen's Mill and valuable asset to the community. The Chair of CCP, Rheta Davison MBE, praised the work and said that the Mill is already becoming a successful destination bringing trade to the town and helping to make Castleford a more sustainable and attractive place for locals and visitors. The Chair of the Trust said that this recent work has only been possible because of the generosity of WREN in making a grant of £45,000 to Castleford Heritage Trust. On January 19th three new customers for Queen's Mill flour have been signed up after Trust volunteers Rod Rayner and David Pickersgill swapped their usual work clothes for shirts and shiny shoes to make a few sales calls. At Off The Hook fish and chips on Beancroft Road, owner Mark Hopkinson is now using it for his home-made mince and onion pies, while round the corner on Smawthorne Lane, Ellie and Emma Cawthra of artisan bakery Bake My Day had made some into brunch muffins - see www.instagram.com/p/BAj9RisCpSV - within a couple of hours of taking a sample bag and ordering another six kilos. Meanwhile, Methley Bridge Farm Shop, at Three Lane Ends, is stocking the flour in 500g and 1.5kg bags, having bought all our intrepid sales reps' samples straight away. The pair had intended to call on more potential customers but will have to wait until more flour has been milled, following what David described as “probably the easiest morning's work I've ever done”. The enthusiasm of all three customers for stocking and using Queen's Mill flour is very encouraging, with Mark, Ellie and Emma all declaring themselves well pleased with its baking properties. 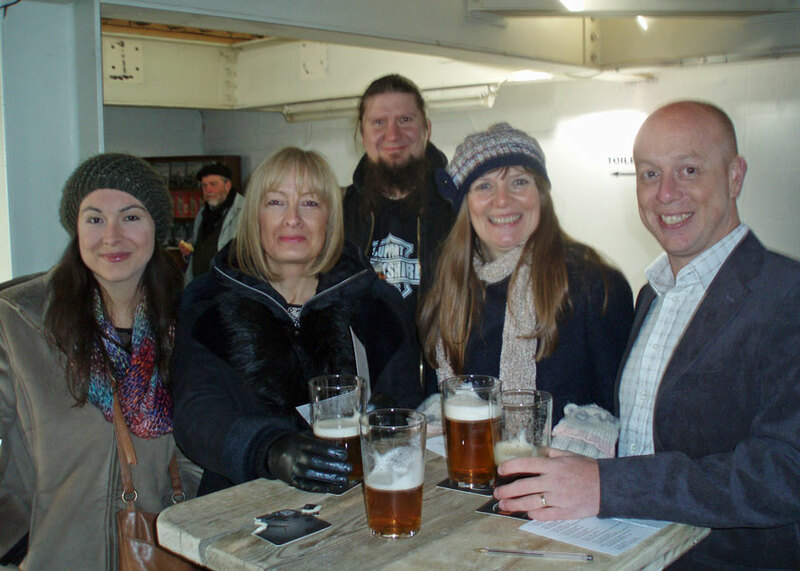 Friday 20th November saw the launch of the first ever Castleford Beer Festival which was held at Queen's Mill. 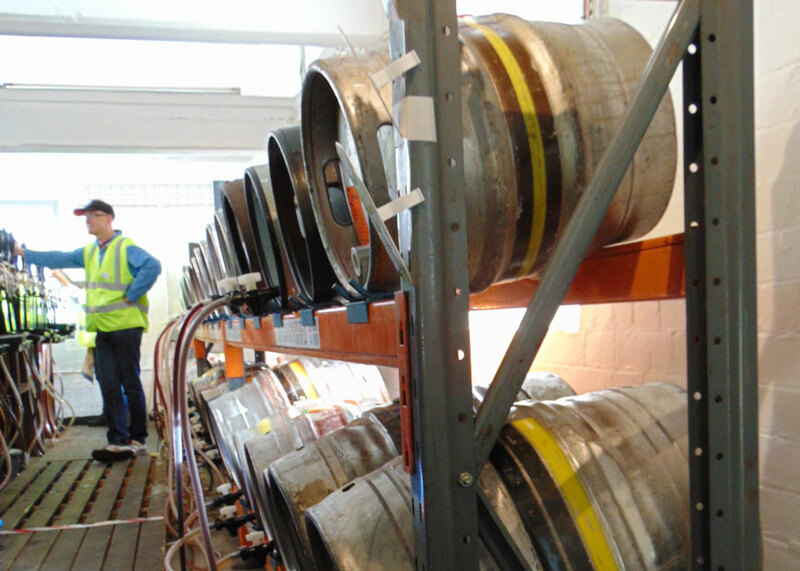 The event where over 500 visitors enjoyed sampling the 30 beers on offer was jointly organised by the Trust and Revolutions Brewery in Whitwood. 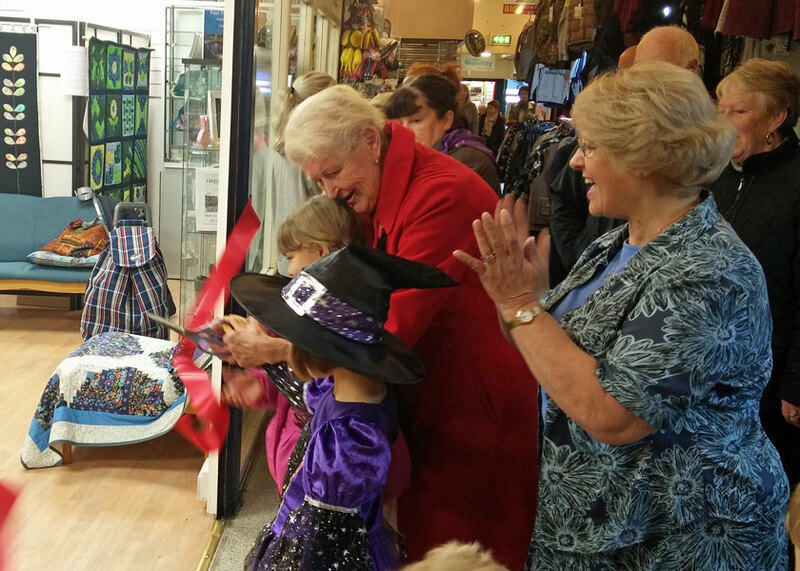 Queen’s Mill Crafts got the official stamp of approval on Saturday when chair of trustees Alison Drake and volunteer Wendy Rayner officially opened the store on October 31st, Halloween, at Castleford Indoor Market following a total refit. The shop, which sells handmade items crafted by CHT’s Knit and Knatter and Quilting groups, along with work made by other local crafters, had been closed for three weeks to complete the refit, which saw our volunteers fit all new shop fittings, which had been kindly donated from a closed unit at Carlton Lanes. 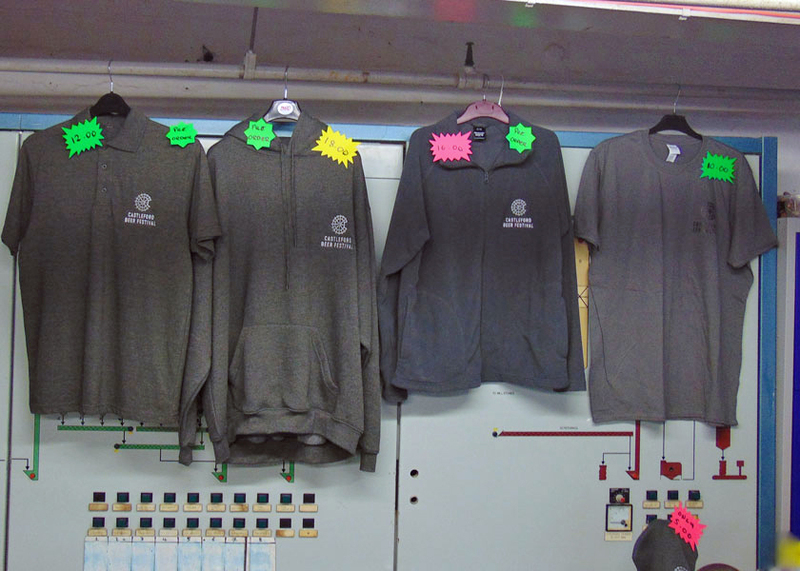 To go with this, we have also rebranded the shop as “Queen’s Mill Crafts – Handmade in Castleford”. It has already proved a big hit with volunteers, crafters and customers, and it is hoped the bright new look will help boost sales, all of which helps to support the work of Castleford Heritage Trust. A new enterprise is doing its bit to revive a Castleford industry with the launch of a new paint a pot business at Queen’s Mill. James and Ruth Knowles launched Riverside Paint a Pot at Queen’s Mill on Saturday October 17th. They will be operating every Saturday from 10am to 5pm. The venue has room for up to 26 people, and it is advisable to book a place in advance, although people can just drop in as well. They can also do special events like birthday parties and evenings by arrangement. Completed items will be available for collection from seven days later. On Saturday 10th October the Trust played host to the Society for the Protection of Ancient Buildings Milling section Autumn conference, which was entitled “MIlling In God's Own County”. as well as a talk on the history of mills in the immediate location. The opening talk, “Queen‘s Mill, Past, Present and Future” was given by Trust Chair Alison Drake MBE, this gave the audience a history of Castleford and a flavour of the work done by the Trust. During the lunch break the Society members were given guided tours of the Mill by volunteers Rod Rayner and John Parker, lunch being provided by Castleford Tea Rooms. Delegates also took the opportunity to explore the Millennium Bridge and take photographs of the bridge and the exterior of the Mill. 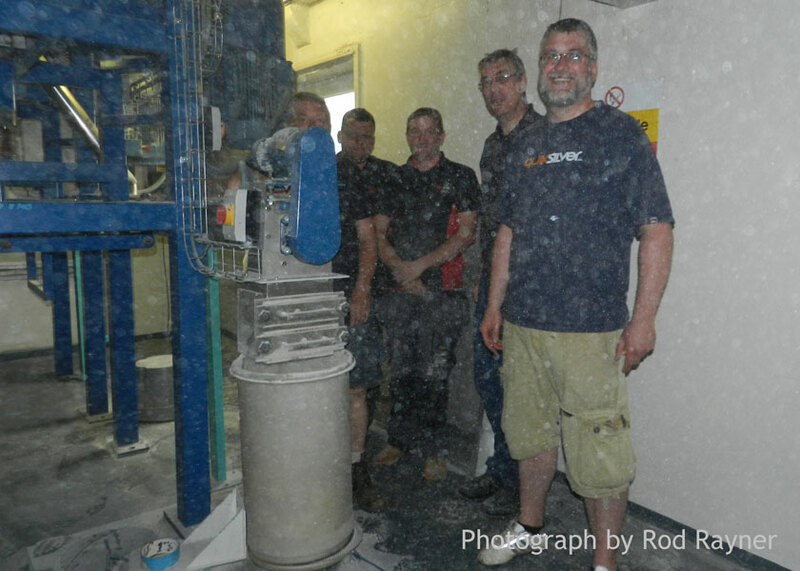 After the event closed Alison said, “Everyone was absolutely delighted with the mill. I am very proud of the volunteers who prepared the venue - they worked very hard and it looked pristine. All the talks were extremely interesting and the catering was delicious - the event was really good. We had delegates from all over - Devon, Dorset, Hampshire, Cumbria - as well as mills closer to home such as Darrington and Ackworth. The organisers were delighted with the mill, they had no complaints. On Tuesday 10th November a local Yoga teacher is offering people the chance to try Feel-Good Yoga for free. An hour long introductory session will be held at Queen's Mill begining at 19:30. Feel-Good Yoga is suitable for men and women, all ages and abilities. Baking fans are being asked to call on their flour power to come up with recipes for a new book to raise money for Castleford Heritage Trust. 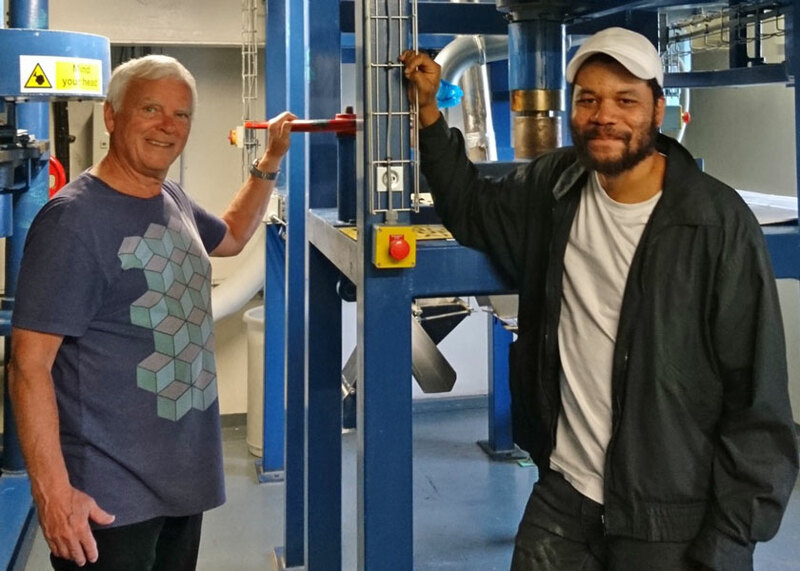 The trust, which has recently started milling traditional wholemeal stoneground flour at its home, Queen’s Mill, wants to produce a recipe book using the flour to help swell its funds to refurbish the building. The wheat used to produce Queen’s Mill flour is grown a few miles away in Kellington, and is hand-sieved to give a unique wholemeal flavour. All the recipes sent in will be tested by volunteers before going into the book. Alongside the book, the website is also featuring a recipe of the month using Queen’s Mill flour. 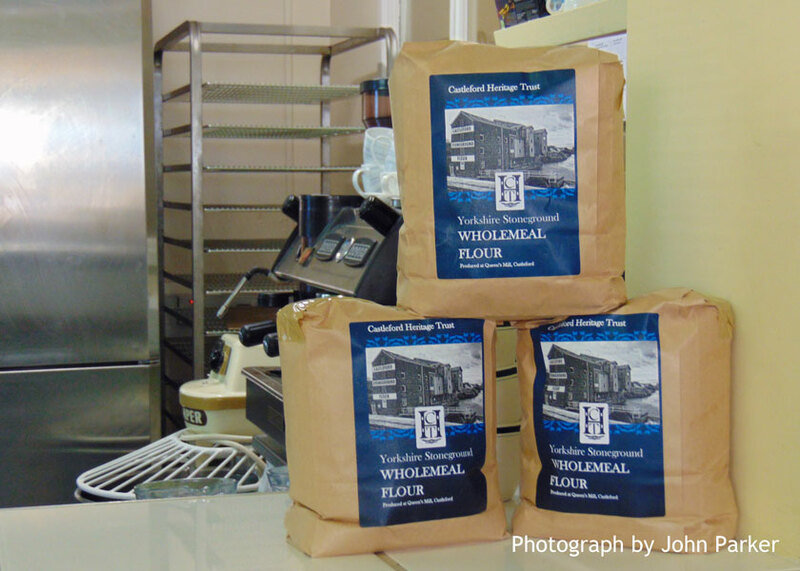 The flour is on sale at the trust’s shop at Castleford Indoor Market, and from Queen’s Mill Tea Rooms. On Saturday 10th October the Trust will host the Mills Section Autumn 2015 Meeting of the Society for the Protection of Ancient Buildings, (SPAB), at Queen's Mill. The Society for the Protection of Ancient Buildings is involved in all aspects of the survival of buildings which are old and interesting. Their principal concern is the nature of "restoration" or "repair", because misguided work can be extremely destructive. The meeting will feature talks by members of the society covering a variety of topics as well as a contribution from members of the Trust. There will also be the SPAB Mills Archive Bookshop and tours of Queen's Mill. Places cost £35 each or £40 with lunch. To book a place at the event please download the PDF file below. 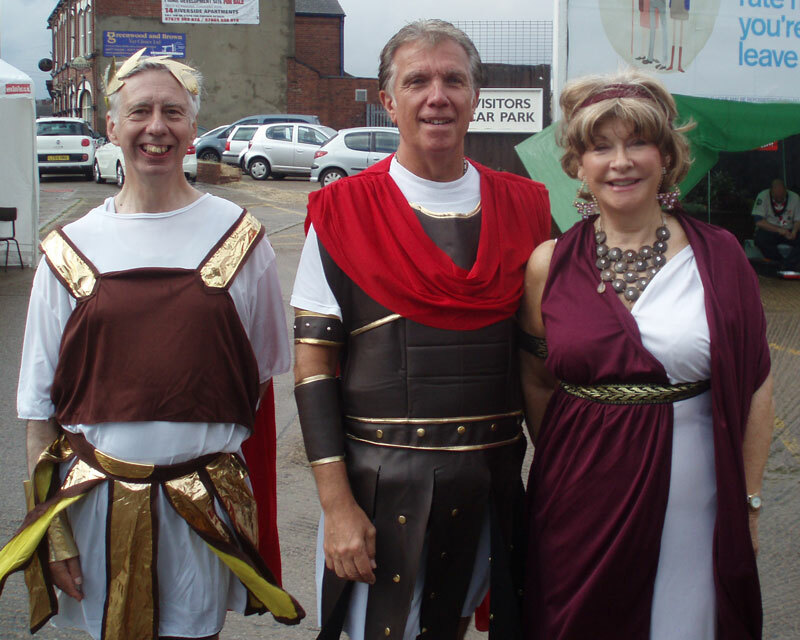 One of the visitors to our September open day, Denise Rowlinson, has sent us this picture of trustees Alison Drake and Dave Wilders joining in with the Roman theme and showing off some of the artefacts. If you have any digital photographs you would like to share with us you can do so via the link on the 'Contact Us' page. If your photographs are prints call us on 01977 556741 and we will get them digitised and return them safely to you. 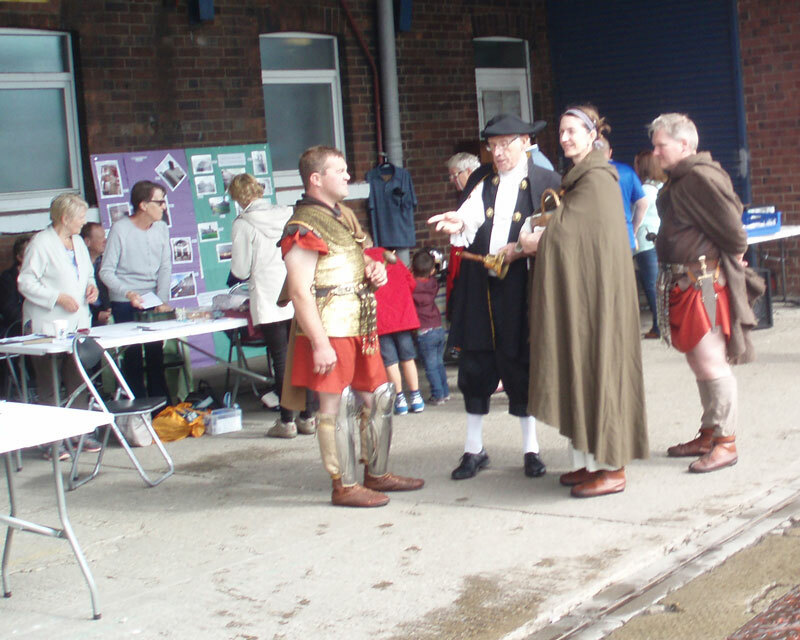 The Trust held a Roman themed open day on Saturday 12th September which ran alongside Roman themed events taking place in the town. 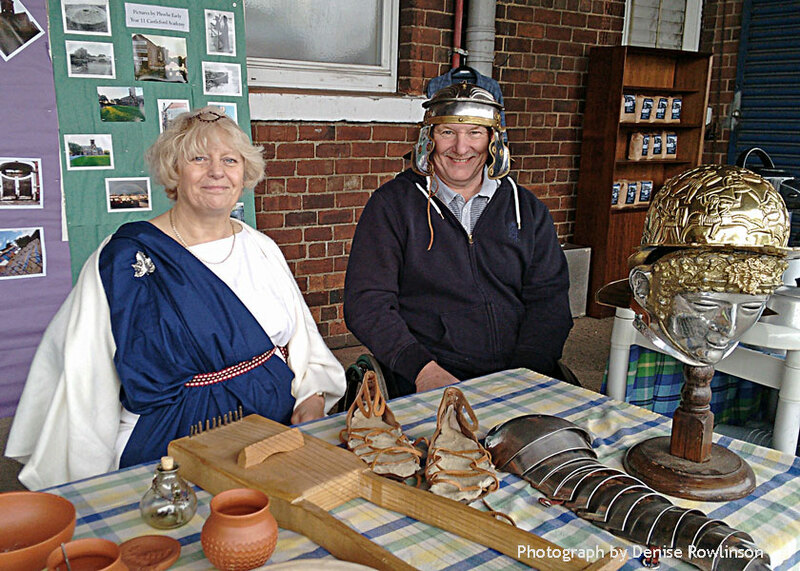 Some of the Trustees and volunteers donned Roman garb and a display of reproduction Roman artifacts gave visitors a glimpse of life in Roman Britain. On sale for the first time at an open day were bags of flour that had been milled on site by a team of the volunteers. The event raised over £800 on the day, the organisers of the tombola would like to thank all the people who contributed prizes for their generous support. The Trust would also like to thank ASDA for their donation of a food hamper which was won by Mrs. Myers of Castleford who can be seen collecting her prize from the Tust shop in Castleford Market. Pictures provided by Councillor Tony Wallis. Local crafter Krissy Warriner is supporting Castleford Heritage Trust with a series of button making workshops, which launch on our open day on Saturday September 12. Krissy will be holding the workshops, to make Dorset waterwheel buttons, to help raise money for the restoration of Queen’s Mill waterwheel. For just £3 you can learn to make this pretty button to take home, and Krissy is donating every penny to the waterwheel project. She will be here on Saturday from 10am, and is hoping to do a series of fundraising button workshops for the wheel project. 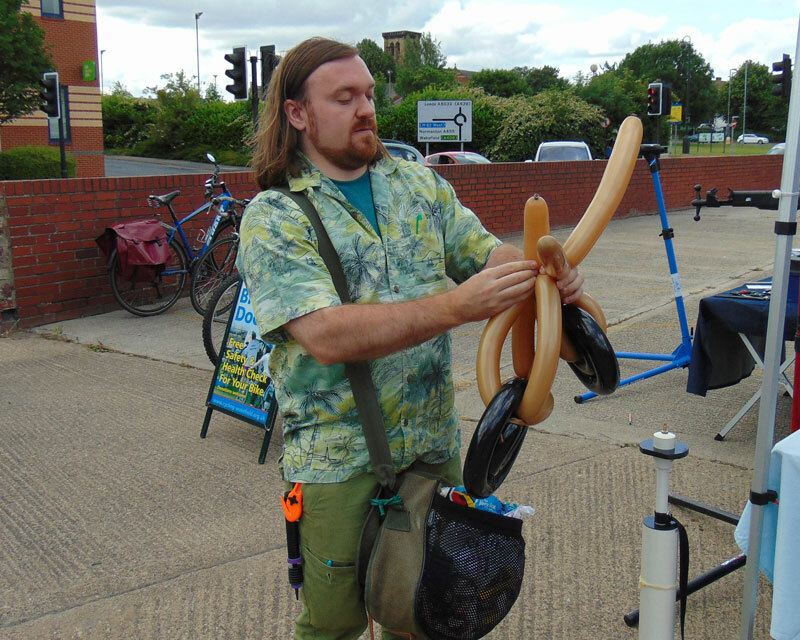 :So come down and have a go, or sign up for a future workshop! 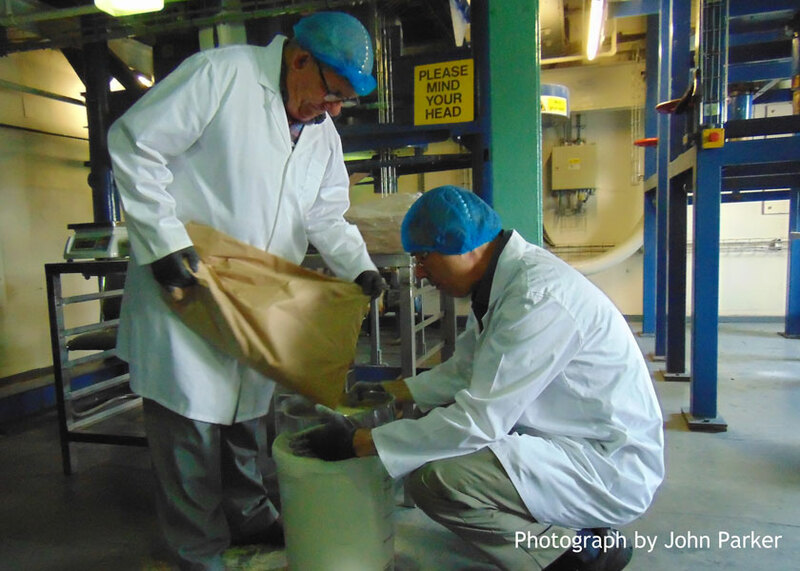 On Thursday 27th of August the “Working Towards Milling” Team led by Rod Rayner produced the first batch of flour available for sale to the public since Queen's Mill ceased production in 2010. This marks a further step forward by the Trust in its plans to restore the Mill and create a business facility and community hub. 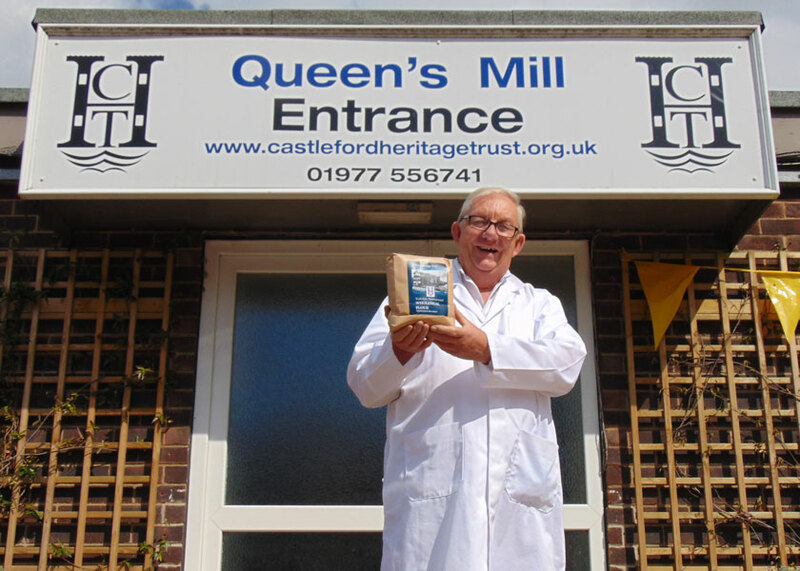 The first batch of flour was milled from locally grown wheat and made fifty 1.5kg bags which are on sale in the Queen‘s Mill Tea Rooms and the Trust Craft Shop in Castleford Market Hall at £2.50 per bag. The first bag of flour was sold to fellow volunteer John Parker who plans to bake a traditional date and walnut loaf for the team to try out. On Sunday August 16th the Trust held a a special open day to mark the anniversary of the 1795 Castleford Corn Riot. The event started at 10am with visitors being given the opportunity to take a guided tour of the Mill and to sample bread baked on site by The Bay Tree Bakery using flour produced at the mill. In the afternoon local historian David Pickersgill gave a talk on the 1795 riot before Commoners Choir performed a short concert of their own songs including a specially written song about the riot. The group had earlier assembled at Thwaite Mills in Leeds before travelling to Castleford along the Aire and Calder navigation. 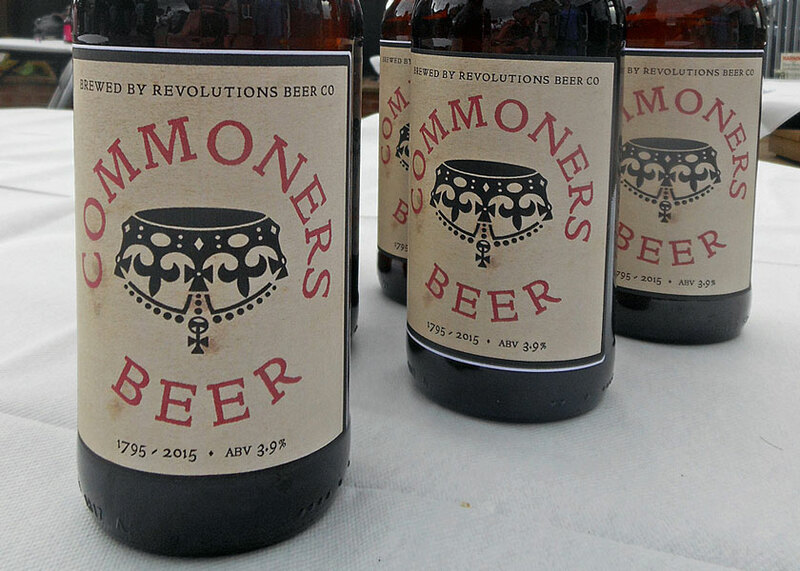 As well as being able to sample local bread visitors were able to sample a special "Commoners Beer" brewed for the occasion by Revolutions Brewing Company, Castleford. Alison Drake, chairwoman of Castleford Heritage Trust, said: “I think this is a very special event because it is not just an open day, it is a commemoration of 220 years of our history. 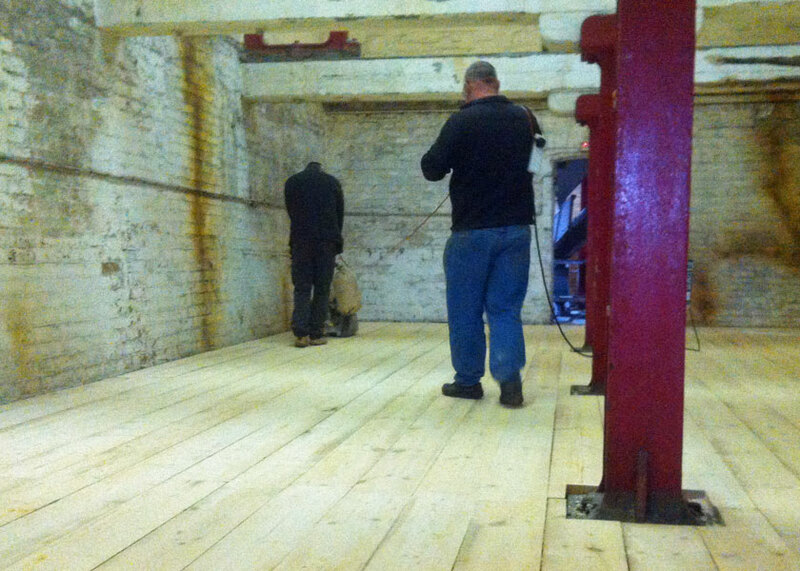 We ran guided tours of the mill so people could see the transformation of the mill for themselves. People could look at the work we’ve done to unearth the archaeological wheels too." Two exciting new ventures have joined forces with Castleford Heritage Trust as it works to transform the town’s Queen’s Mill into a new community hub. 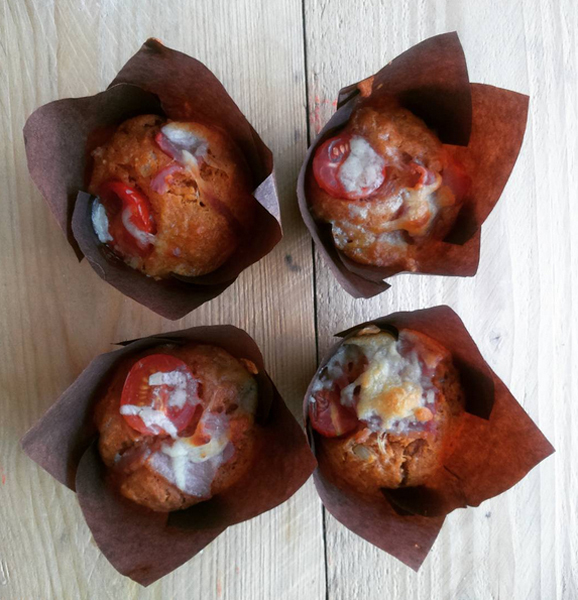 New local business The Bay Tree Bakery has moved into the mill to produce traditionally produced bread, while local business woman Dana Russell is taking over the mill’s café, which was re-launched as Queen’s Mill Tea Rooms on Saturday August 1st. The mill’s café has been manned by volunteers since the trust bought Queen’s Mill in April 2013. 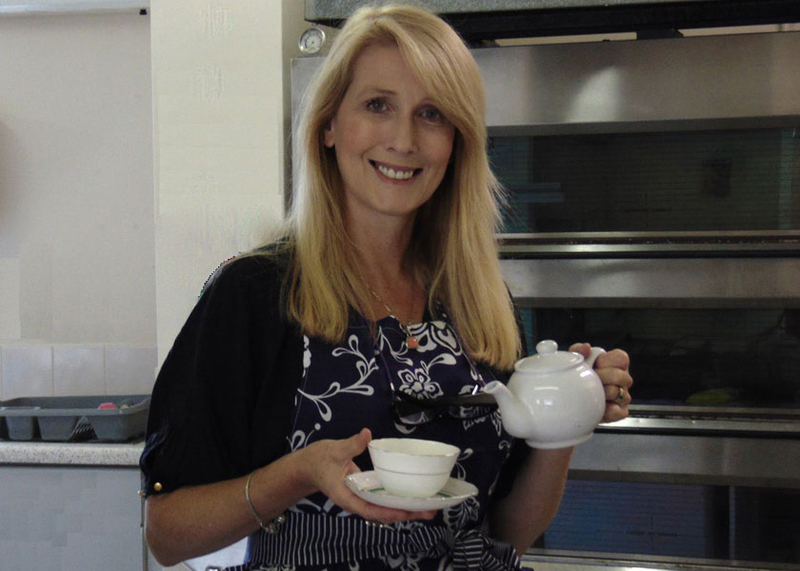 Dana, who is also a partner in Ambassador Catering Events and has ten years of catering experience, is transforming the café into a new-look licensed luxury tea room. 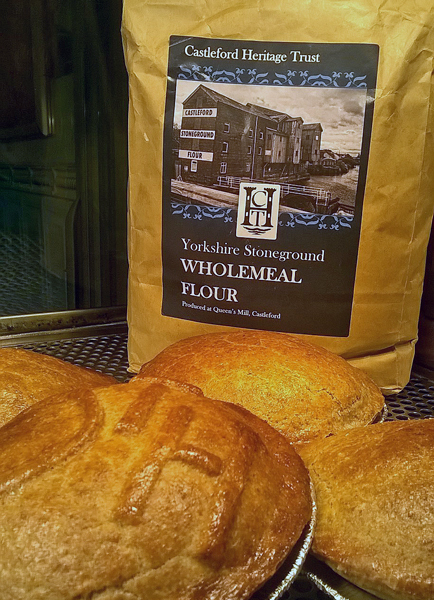 The Bay Tree Bakery is run by ex-teacher Stuart Boothman, and produces a range of artisan breads using locally sourced ingredients which he sells at farmers’ markets around Yorkshire. 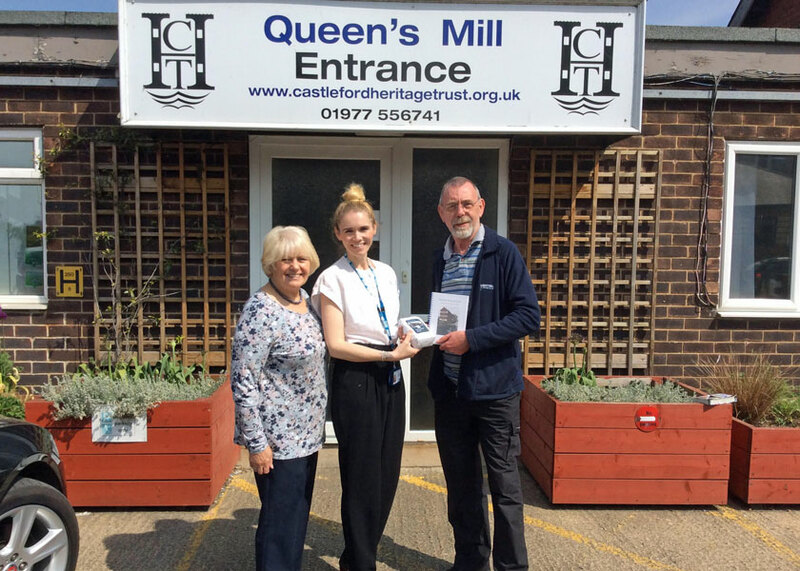 Queen’s Mill’s volunteer-run café closed for the final time on July 17, and Castleford Heritage Trust rewarded volunteers for their hard work and dedication with thank you gifts. The trust presented café managers Stef Petrow and Claire Pouton with special gifts as a thank you for their work running the café at Queen’s Mill for the last two years, as well as their contribution to running the café at the trust’s previous home in Bridge Arts. The other regular café volunteers were also given boxes of chocolate as a token of appreciation. Alison Drake, chair of trustees, presented the volunteers with their gifts and thanked them for their contribution to the trust. They will be carrying out different volunteering roles in future at the mill. 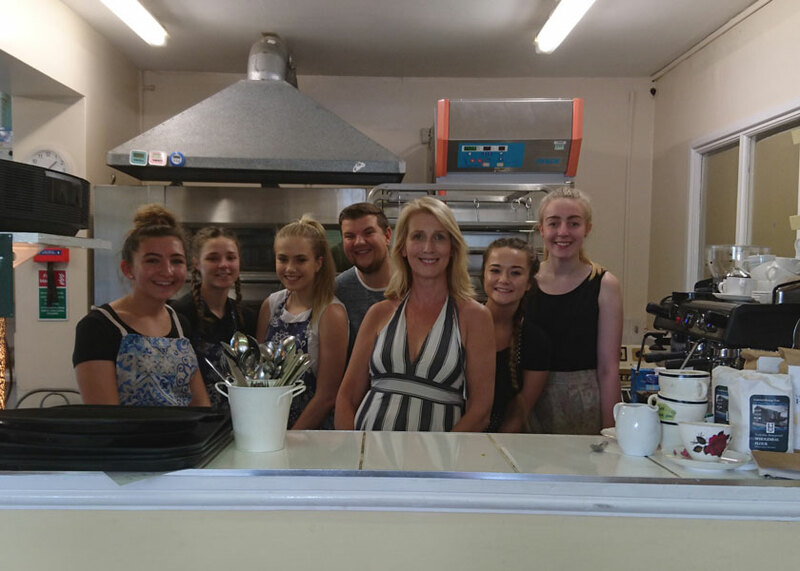 The café has been taken over by local businesswoman Dana Russell and is currently being refurbished as Queen’s Mill Tea Room, which will open on Saturday August 1st. Visitors flocked to Queen’s Mill on Saturday July 11th for our summer open day, where the attractions included the first chance to taste bread baked from flour milled by our milling volunteers. There were hundreds of people, coming not just from Castleford, but Wakefield, Harrogate, London and one visitor all the way from Australia, to go on tours around the mill, listen to Dr Andrew Rollinson’s latest talk about the waterwheel and enjoy entertainment from local youngsters. 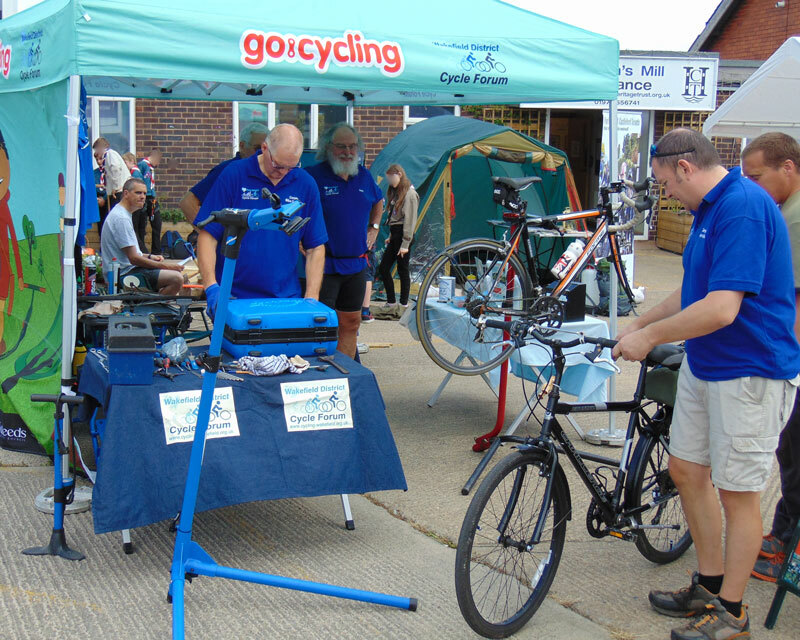 There were also stalls selling crafts and children’s activities, along with a bike doctor from Wakefield Cycle Forum and Scouts showing off their skills. “Enjoyable, fun and interesting tour. Good work being done. Can’t wait until it’s all finished”. A big thank you to all our volunteers for helping on the day, and for their tireless work getting the mill ready for the event. Thanks to all their effort the open day raised over £1,000. Esther, Wilf & Hazel who ran the tombola would like to thank everyone who contributed to help them raise over £150. Pictures provided by webmaster John Parker. On Thursday the 16th of July, the Queen’s Mill Café, which has been run by our team of dedicated volunteers for the past couple of years, will close for two weeks. On Saturday the 1st of August it will re-open as the Queen’s Mill Tea Rooms and be run by local business woman and outside catering specialist Dana Russell. Dana has exciting plans, from re-decoration to new menus – we’ll have more details over the coming weeks. Our volunteers have done an amazing job of running our café and the Heritage Trust thanks them all for all their hard work and commitment. 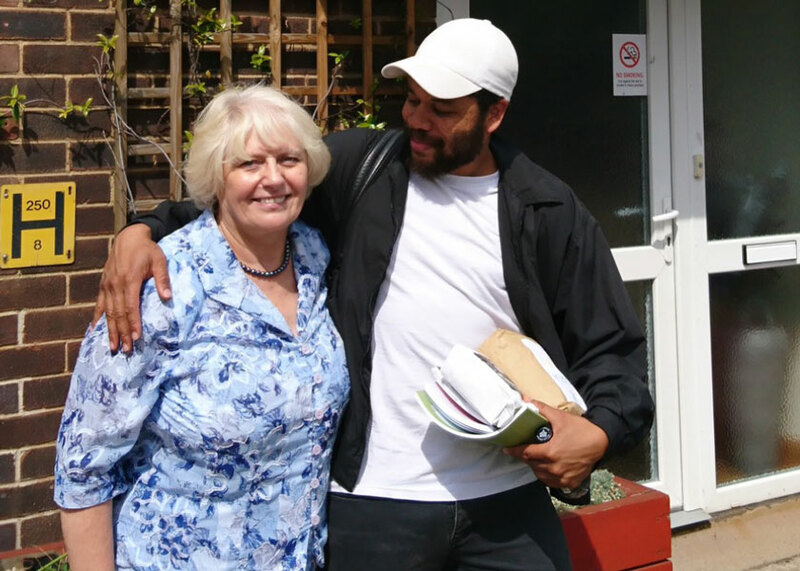 It’s not goodbye though – there are plenty of other projects which they will get involved with at the mill, and our regular customers will no doubt see them around the site. Our Visitor Information Centre will remain in the Tea Room and continue to be managed on a voluntary basis by Norma and Frank Sedgwick. 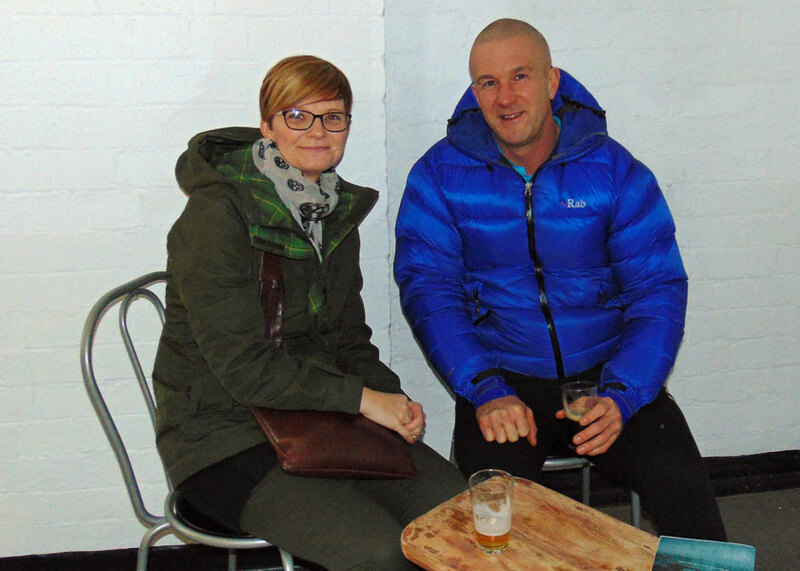 We are very excited about Dana setting up her new business at Queen’s Mill, which brings us a step nearer to realising our vision for the mill as a supporter of local businesses as well as the community. Thursday the 25th of June saw work commence to remove unwanted vegetation from the bank of the River Aire at the rear of Queen's Mill. 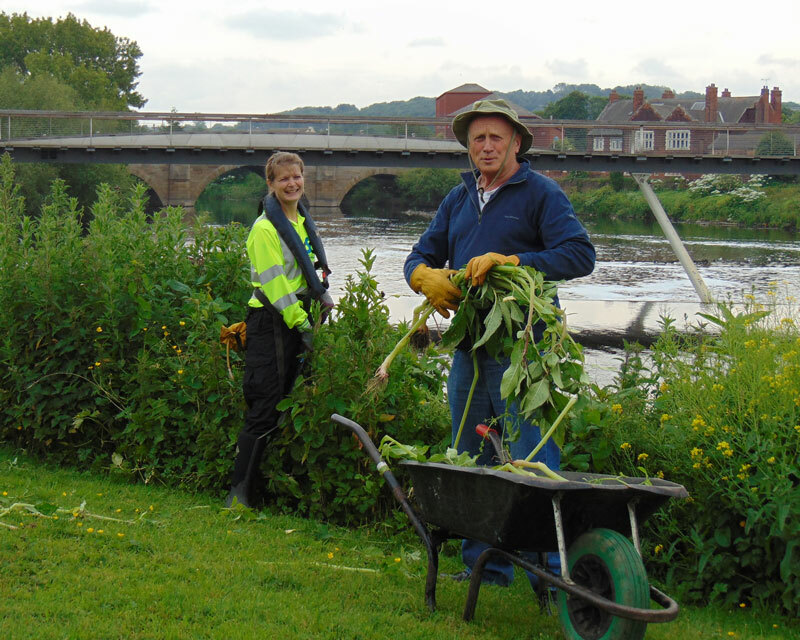 The team led by Hellen Hornby of the Sheffield River Stewardship Company, (RSC), will be removing Himalayan balsam and giant hogweed from the river bank in a series operations over the next few months. Hellen was joined by local volunteers and colleagues from RSC and the Environment Agency who started to clear the bank from the start of the weir before moving upstream towards Castleford Lock. More volunteers are needed to help improve the riverside area in Castleford. 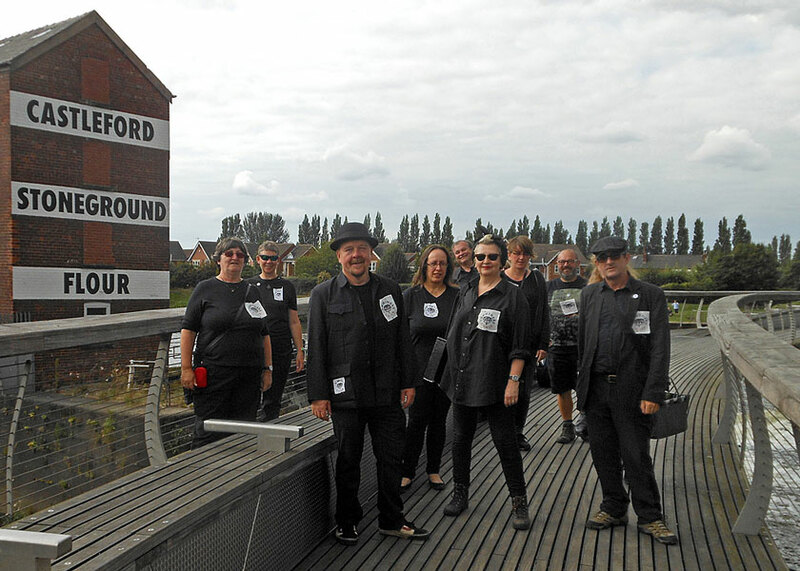 The volunteer days are open to all and anyone wanting to get involved should contacting Trish Ellis at Castleford Heritage Trust on 01977 556741 or email trish.ellis@corganisers.org.uk. Keen photographer James Appleyard is adding his expertise to support Queen’s Mill’s waterwheel restoration project. James, 16, a pupil at St Wilfrid’s RC High School, will be charting the progress of the restoration project, headed by Dr Andrew Rollinson, by taking photos of the work. His pictures will be used in the Pontefract and Castleford Express to accompany a regular column being written by new volunteer David Pickersgill, a former journalist, who is also helping with the restoration project. 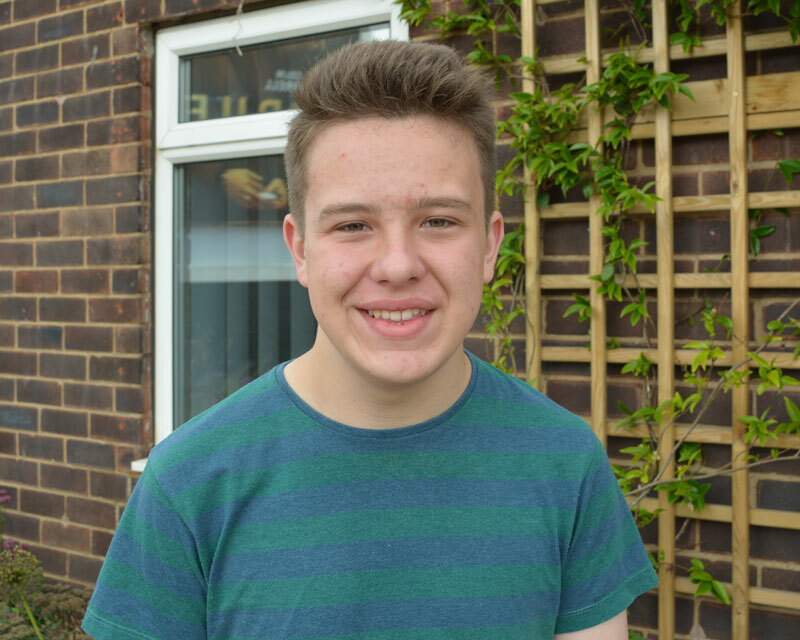 James has just completed his GCSEs and plans to study photography at A level. He is one of Castleford Heritage Trust’s youngest volunteers. 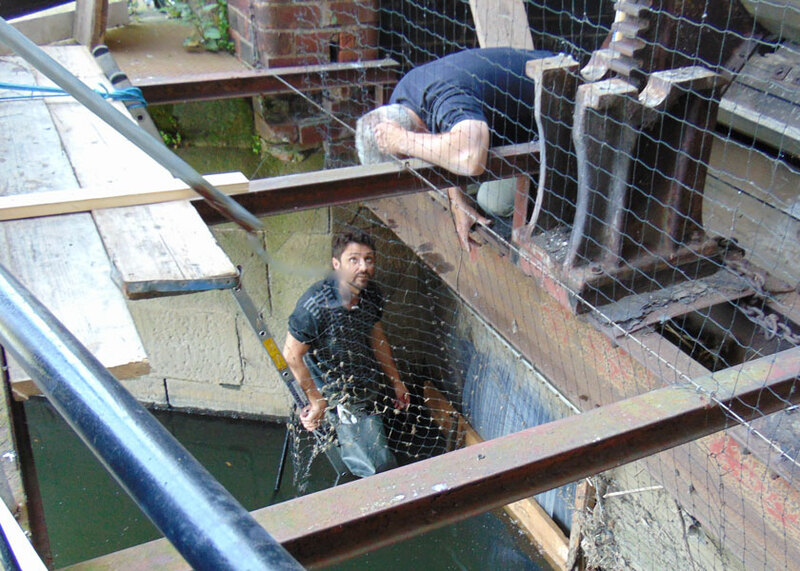 On Friday the 12th of June a team of volunteers led by Dr. Andrew Rollinson put in place a temporary stop to the sluice gates of the water wheel. 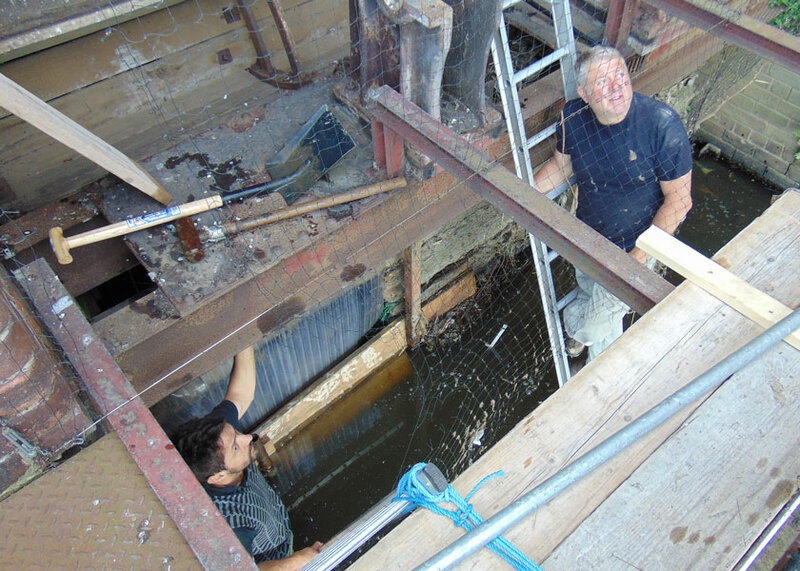 The condition of the timbers on the existing sluice gates had deteriorated allowing the river water to pass into the wheel chamber which made any work on the wheel unsafe. Lengths of timber were cut to length and hammered into place by Dr. Rollinson who was wearing waders to carry out the work, with the stop in place restoration of the wheel can safely take place. On completion of the task Dr. Rollinson commented; "This is a temporary installation to repair the sluice gate. It will allow us to explore inside the wheel housing as the broken timbers were letting water through. The main dam will hopefully be in place later this year when we install stop logs into the head race a few metres up channel". The pictures below show the volunteers carrying out the work with the completed task being pictured from the far bank of the river. 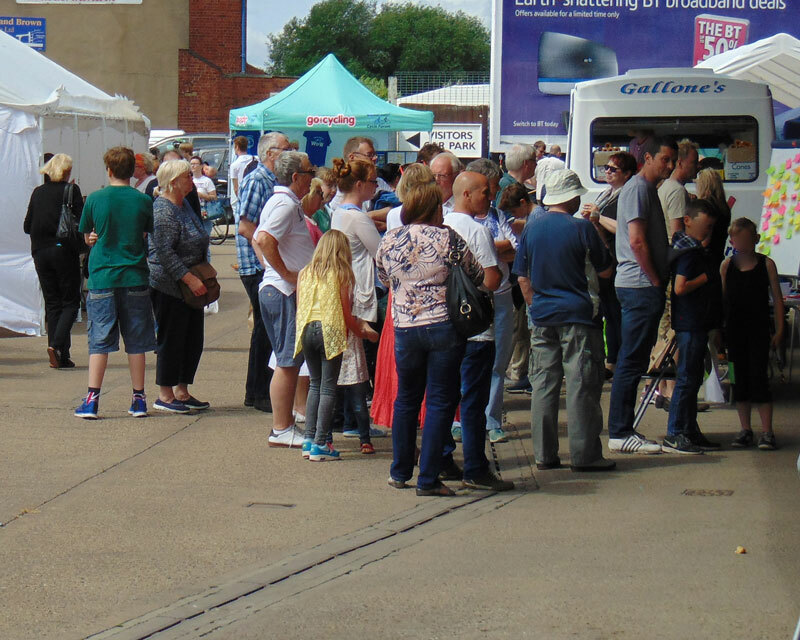 Seasonal weather ensured a bumper attendance at the fifteenth annual Castleford Canal Festival on Saturday May 16th. The event is a joint venture organised by Castleford Heritage Trust, hosted by The Canal and River Trust with the boat rides being run by The Safe Anchor Trust a charitable organisation from Mirfield. Safe Anchor visit Castleford Lock every May and stay for ten days, during this time they offer free boat rides to local school children and community groups. During the day the mill was open for car parking, guided tours and drinks. 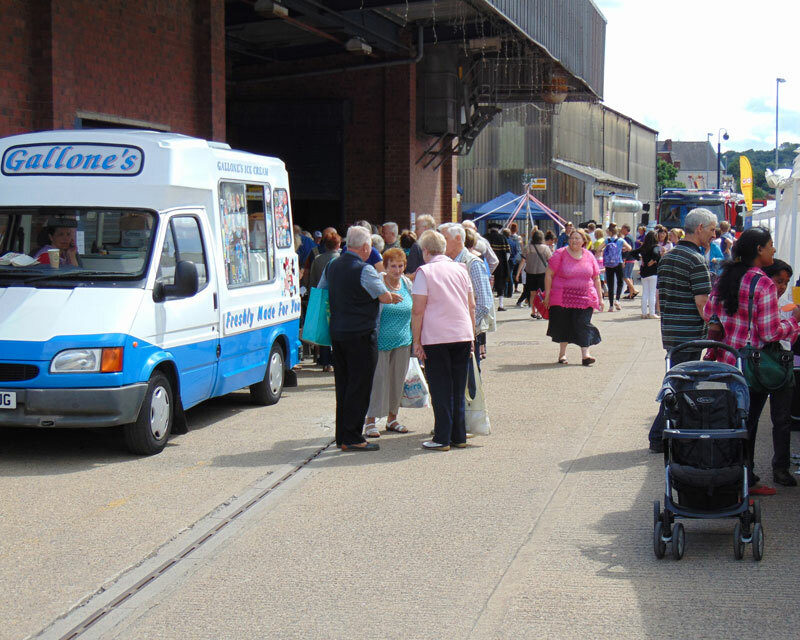 Meanwhile at the lock the crowds had the opportunity to buy burgers and ice creams and also browse around the craft stalls being operated by the volunteers. The Canal Festival included a children's activities tent organised by Trust volunteer Alison Fender pictured here with Alfie Knowles, with a range of activities aimed at children and young people including a wildlife spotter sheet with free prize draw, a colouring-in competition and children’s tombola. More than 50 children took part in the wildlife spotter activity and 50 children entered the colouring-in competition. Feedback on the day from both children and parents was very positive and the competition winners are below. 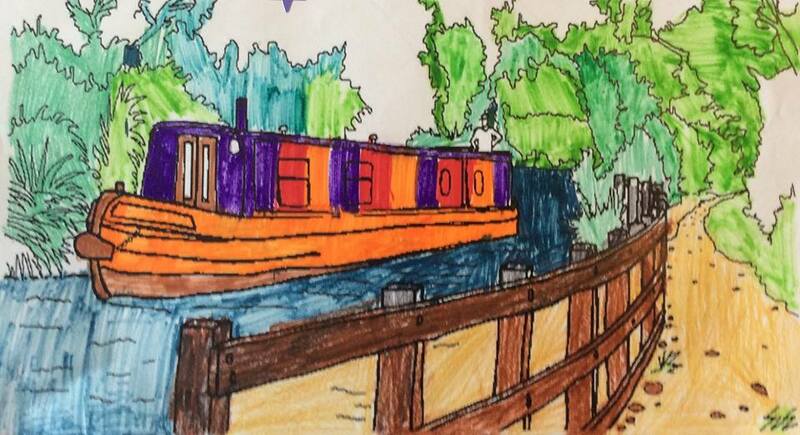 Colouring-in 1st prize : Alfie Knowles, Age 5, Glasshoughton Infants School. Runners up : Jacob Breslin, Age 9, St Joseph's J&I School; Tia Garside, Age 5, Wheldon Road Infants School; Katelan Gale, Age 8, Willow Green Primary School. 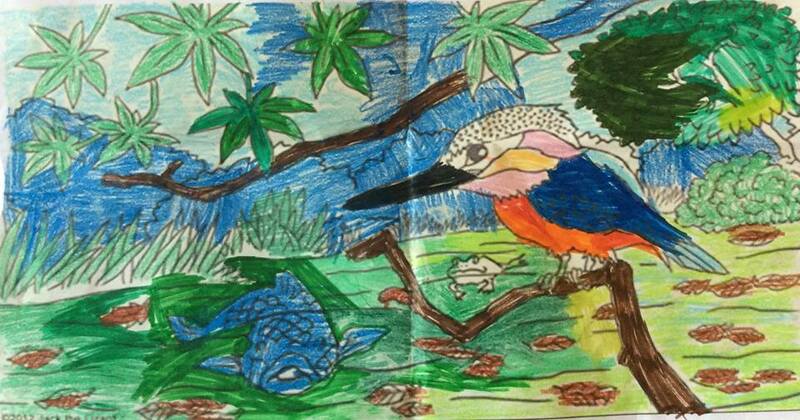 Wildlife Spotter Prize Draw Winner: Toby Hopes, Age 5, Allerton Bywater Primary School. We had some fabulous entries, and it was very difficult to choose our winners. Here are the winning pictures along with some of the wildlife spotted by Toby. Congratulations to our prize winners and well done to everyone who took part. 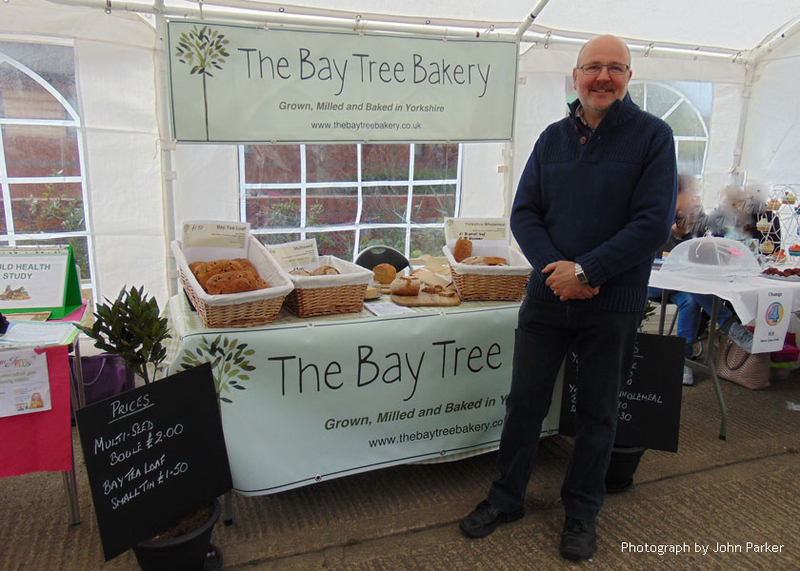 Saturday 2nd May saw the first Queen's Mill open day of 2015 and the launch of our on site bakery The Bay Tree Bakery run by former head teacher Stuart Boothman. Business was brisk as Stuart sold his artisan bread, bread made with flour, water, yeast and salt only – no other additives: no enzymes, no accelerators, and no preservatives. For the launch Stuart concentrated on four lines, Yorkshire White: a traditional white bread, Yorkshire Wholemeal: a tasty traditional wholemeal bread made with stoneground flour, Multi-Seed: a wholemeal loaf with his own seed mix added: sunflower, pumpkin and linseed and his signature loaf, The Bay Tea Loaf: a slightly sweet loaf with currants, and bay tea. 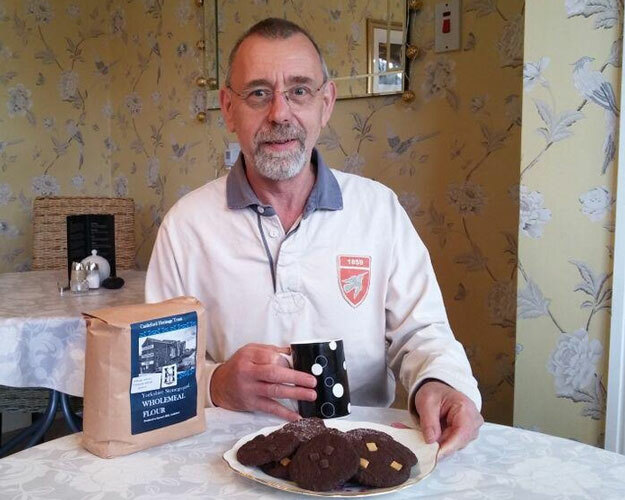 At present Stuart is baking using organic flour sourced from North Yorkshire but he will be using flour produced on site when we start our own milling. 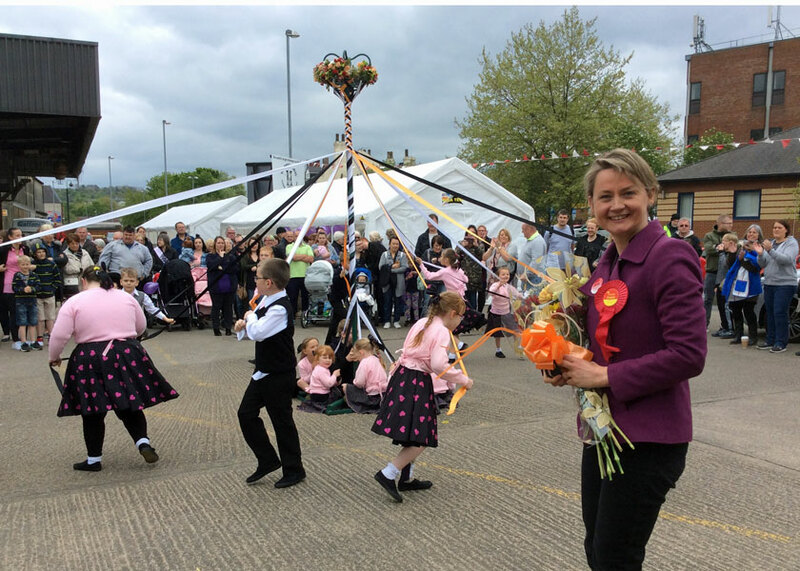 The first open day of the year was opened by Yvette Cooper MP who also crowned the maypole prior to local children giving visitors a demonstration of traditional maypole dancing. 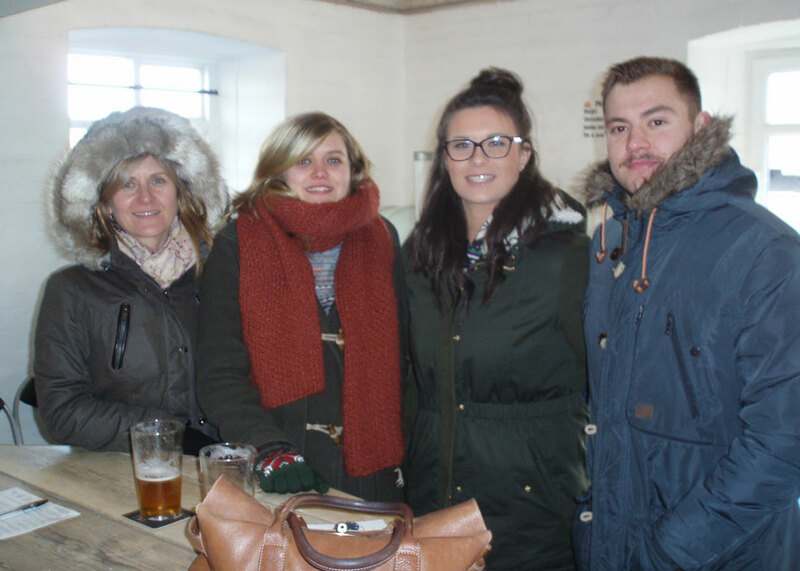 Despite the weather being overcast hundreds of people turned out to enjoy the attractions which included a visit by JT the Castleford Tigers mascot, arts and craft stalls, the opportunity to try pottery painting and button making, live music, and tours of the mill. New to the open day this year were talks by Dr. Andrew Rollinson on the history of milling in Castleford and the work he is undertaking to restore the water wheel at the mill. Here is an extract from Stuart's website which explains how the bakery came to be associated with the Trust. 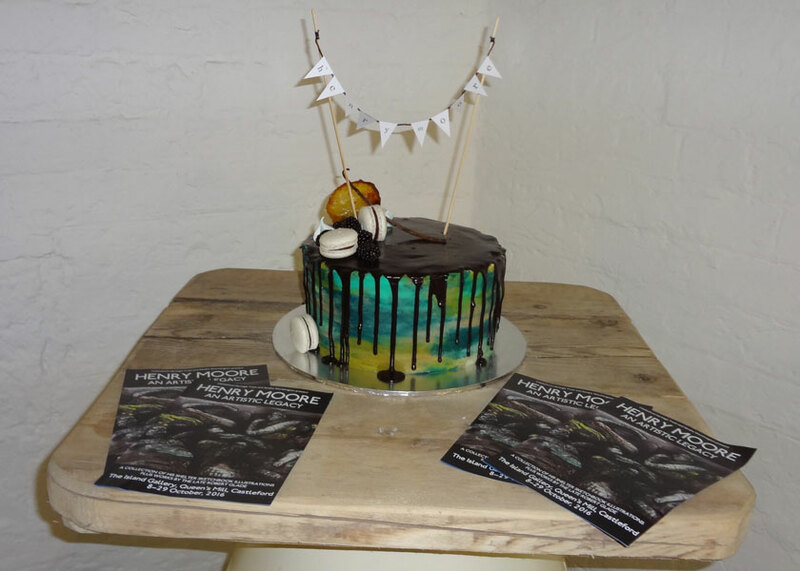 "A friend forwarded me an email from Incredible Edible Wakefield, I went to meet them, was introduced to someone who said “I’ll put you in touch with Castleford Heritage Trust”. So I am looking for somewhere to bake, and the Heritage Trust who own Queen’s Mill are looking for a baker to bake and sell bread using the flour they will mill. I felt that fortune was smiling and this opportunity had fallen into my lap – almost too good to be true!" Stuart then goes on to say, "I really like the trustees attitude – they think big and have a clear vision – all backed up with values that I share. They are investing in the town for the future. Local economic development, training and apprenticeships, a Made in Castleford brand, renewables and sustainability. It is a real pleasure to be associated with the mill. 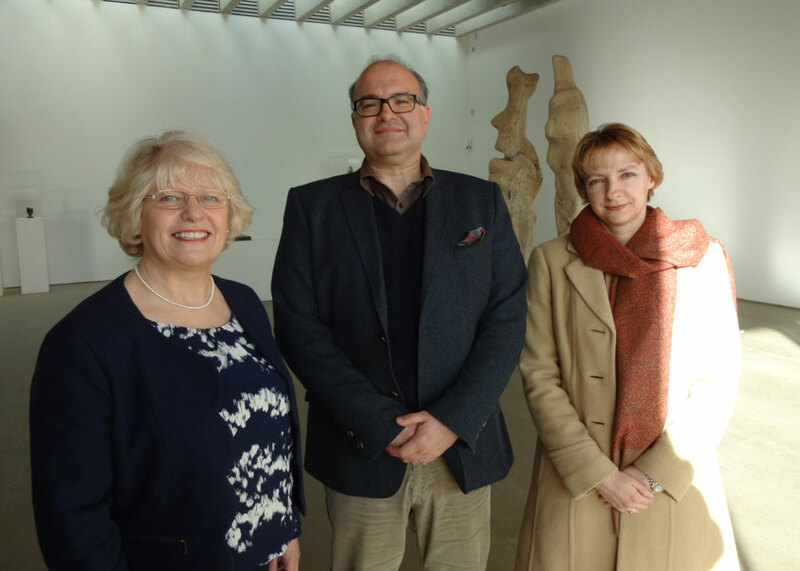 Henry Moore’s family have made a pledge to visit Queen’s Mill after meeting chair of trustees Alison Drake. 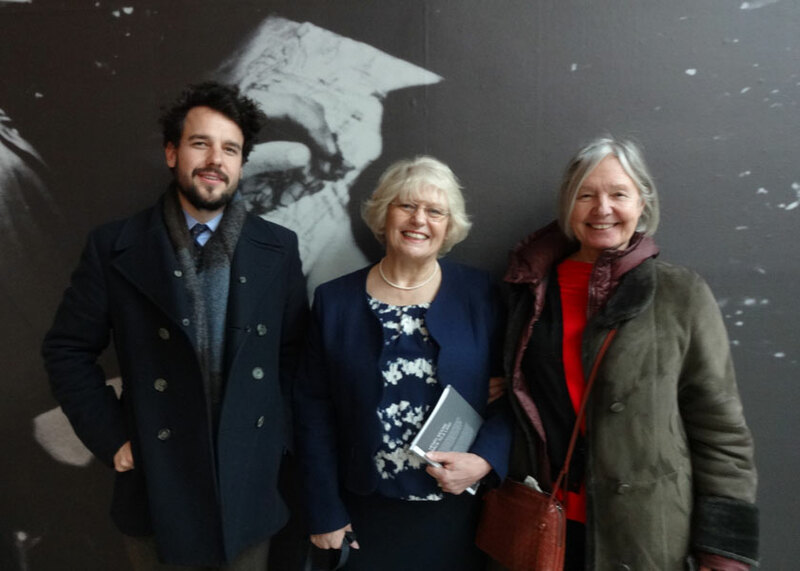 Alison met Henry Moore’s daughter Mary Moore, along with her three children, at the opening of a new exhibition of his work at Yorkshire Sculpture Park in March. The exhibition, Henry Moore: Back to a Land, examines his relationship with the land, along with a room curated by Mary, which gives a personal insight into how her father worked. Building on the success of last year's event the Castleford Heritage Trust invites you to join them at their Race Night on Saturday 11th April at the Lock Lane Community Centre. Tickets are only £5.00 per person which includes entry and a Pie and Pea Supper. Children are welcome to attend (£2.50 PC) but must be responsibly supervised. The Events Teams Chair James Knowles will be on the mike for the night and there will be multiple races for you to place your bets on. The Trust has sold over 70 Tickets sold so far, so this will be an excellent opportunity for everyone to socialise and have some fun! Please contact the Trust if you would like any tickets…bring friends and family along. The Trust can be contacted at the office on 01977 556741. At the Open Days Dr Rollinson will be giving a 25 minute talk titled Science, History, and Heritage Restoration of the Queen’s Mill Water Wheel, Castleford. 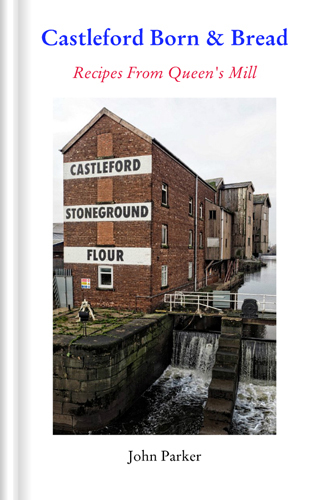 This will explain the significance of the mill to Castleford life, with pictures that show old maps of Castleford going back 200 years. It will explain the science and engineering of why and how the wheel was built, and also how it is being restored by the Trust. Talks will be each hour throughout the day at open days. 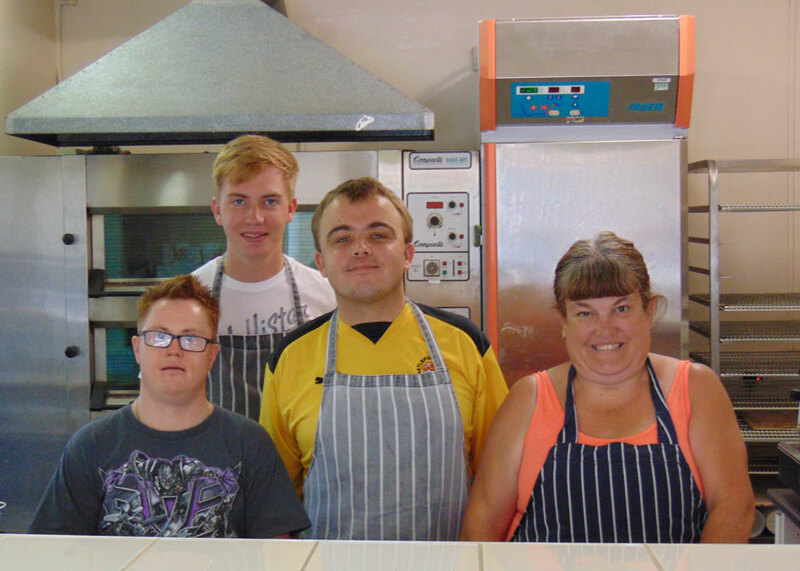 The café at Queen's Mill has been awarded a five star rating by hygiene inspectors. Trust Chair Alison Drake said "This is a great success and a great reward for our hard working staff and volunteers. The café is run mainly by volunteers but they run it to the highest of standards and this is the proof of that. Once the inspector had finished looking around he said it was one of the best cafés he had seen". Pictured from left are volunteers; Scott Till, Claire Pouton, Ricky Felstead and Rob Crosslands. Castleford Heritage Trust is delighted to announce we have received a Special Award of £10,000 from the Royal Commission for the Exhibition of 1851. The award will be used towards the restoration of our Waterwheel at Queen’s Mill. It will fund the stop planks required to isolate the wheel race from the flowing river to enable restoration work to commence, and will also fund the project management and development of this specialist work. The Royal Commission aims to ‘increase the means of industrial education and extend the influence of science and art upon productive industry’. This was originally interpreted as a requirement to create a centre of intellectual excellence, which resulted in the acquisition of the South Kensington estate and its subsequent development with museums, academic establishments and a concert hall (the Royal Albert Hall). Later, in 1890, the emphasis was switched to the support of individuals, starting with the award of Science Research Scholarships from 1891. It also supports worthy individuals and appropriate organisations by Special Awards. On Tuesday 11th November the Trust received the news that it had been granted £3,000 from Lloyds Bank community fund. 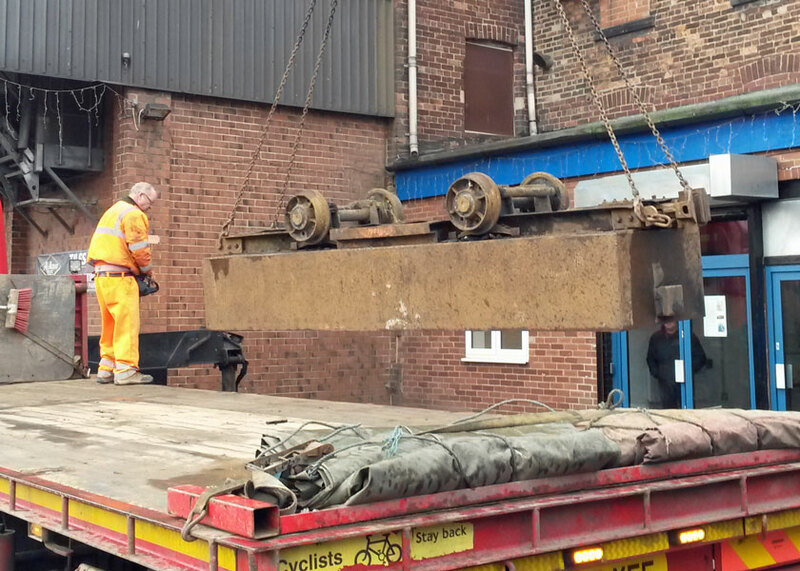 This will help us to restore the milling equipment which is on site. Trust Chair Alison Drake MBE said "I would like to say a big thank you to everyone who voted for us and is supporting what we are doing. It's really nice to know we have got the backing of so many people, businesses and organisations across the area. The grant is fantastic news for us. To get the equipment up and running and the volunteers trained up will be a huge boost to our sustainability. Everything we are doing is part of the regeneration of Castleford and the grant is a boost to our plans". The Trust's vision will see the Mill become an exciting heritage and arts destination for the region and beyond. The project will restore and refurbish a unique heritage building and create a high quality venue for learning, leisure and creativity. The grant will enable volunteers to start using the stone mill wheels to grind flour, which would be used in a bakery. 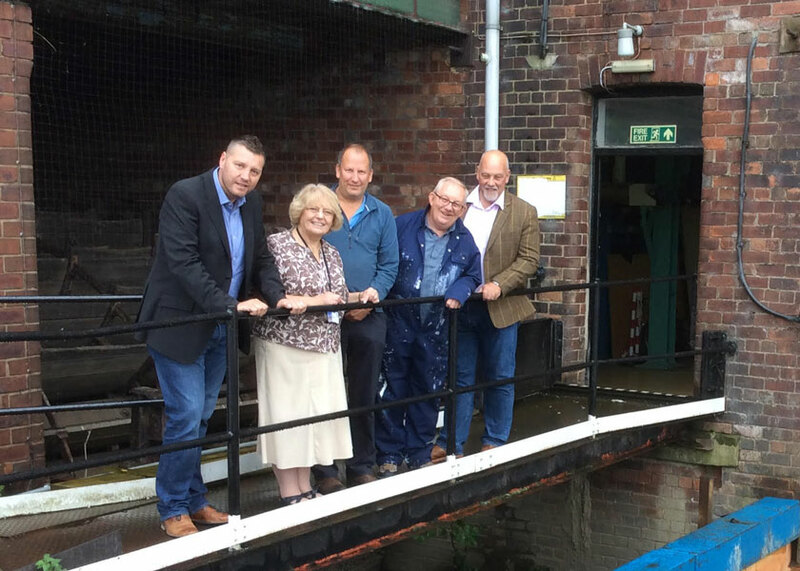 The Trust also plans to get the water wheel working again to generate electricity. Alison also added, "The wonderful thing about this money is having the backing of the community and it's so uplifting that people came out and voted for us. Without the support we wouldn't be able to do what we are doing. The project is going really well and there's a good feeling about everything at the moment". On Saturday 11th October the Wakefield district cycle forum held its first monthly cycle ride using Queen's Mill as a meeting point. The organisers aimed for cycling at an easy-going pace, ideal for beginners, families and those wanting to build their confidence. The ride took three hours using traffic free routes and quiet roads. For future rides the Trust will be opening the café so tea, coffee, toast and bacon sandwiches will be provided by volunteers Claire, Amy and Rod. This ride takes place on the second Saturday of the month meeting at 10:15. For further details check their website: cycling-wakefield.org or download their November newsletter. On Thursday 18th September we were honoured to host a visit by HRH The Duke of Gloucester, who met volunteers, trustees, artists, businesses and pupils from local primary and secondary schools. His Highness toured the mill, meeting our architects and Chair, who presented the mill's vision and redevelopment plans for the future. After the Mill tour The Duke, who read architecture at Magdalene College Cambridge, was shown Castleford footbridge by Renato Benedetti who designed the structure. Among the guests were representatives from Goverment agencies, national companies and local businesses. The Duke also unveiled the Civic Trust's blue plaque for the mill and enjoyed a lunch of local produce before his next engagement. One of the highlights of the royal visit was a tremendous singing performance by pupils from our local primary schools who gave a rendition of Castleford Our Heritage which had been specially written for the occasion. Afterwards David Hookham who conducted the performance was approached by the Chief Executive of Castleford Tigers who asked if the children could sing the Heritage Song on the pitch before the next Tigers game. Commenting on the day Alison Drake said, "This has been a fantastic event for Castleford Heritage Trust and for the whole town." Following on from the success of the open day The Trust held a vintage tea party on Sunday 14th to celebrate the 93rd birthday of their president, Winnie McLoughlin BEM. The party was well attended by members of The Trust, along with friends and well wishers all taking tea from fine china tea sets, and to mark the occaision a special birthday cake had been produced. This was a day to commemorate a milestone in the life of a remarkable woman. Our President, Winnie McLoughlin, has been the President of the Castleford Heritage Trust since it formed in the year 2000. 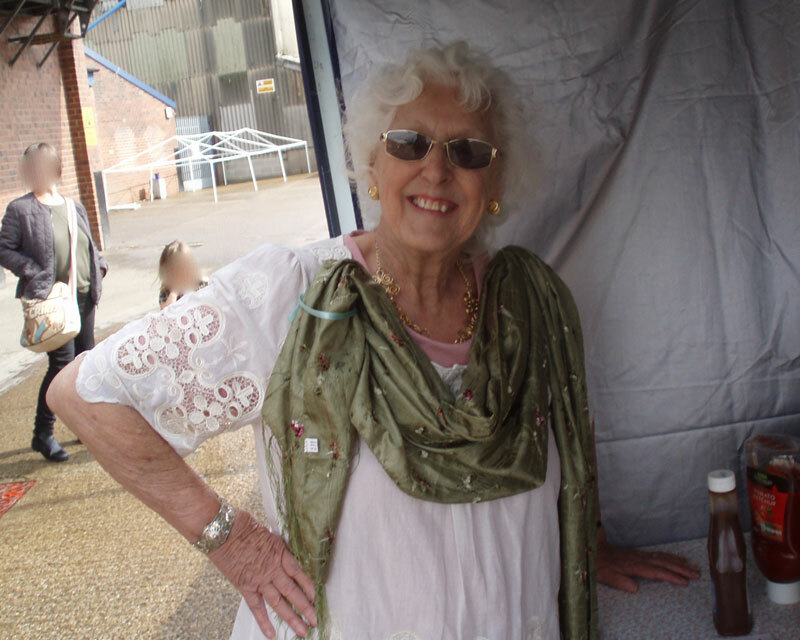 Winnie has served the community for many years, being a local Councillor from 1955 to 2000. In that time she was Mayor of Castleford from 1971 to 1972 and Mayor of Wakefield Metropolitan District from 1980 to 1981. The Queen’s Mill open day on Saturday 13th September 2014 was another very well attended and successful day for Castleford Heritage Trust. 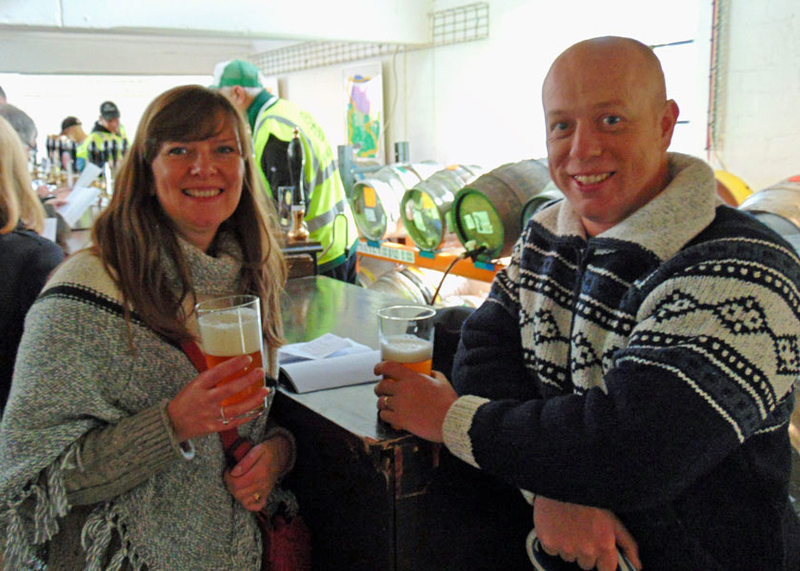 Featuring Revolutions Brewery for the first time, as well as lots of craft stalls, the event attracted well over 500 visitors. 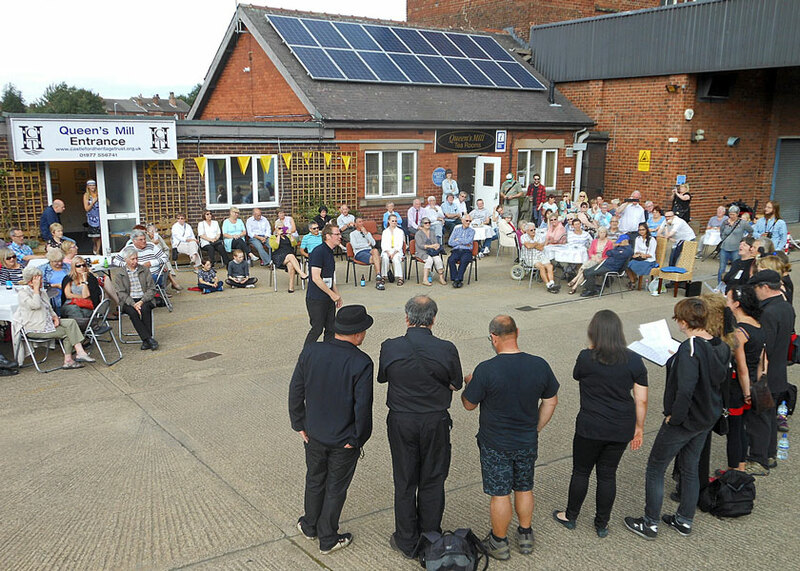 The event included more music and dance performances than at previous open days, and each was received with high acclaim from the audience. Local musician, Jack Edwards, kicked things off with an impressive acoustic set in the morning, followed by another brilliant performance by impressive singing trio Niamh Raven, Courtney Cranton and Jess Edwards (all from Castleford Academy). Victoria School of Dance also entertained the crowds with several impressive routines, danced throughout the day, and then the event was headlined by local band Third Knight (all from Castleford Academy, and previous winners of “Cas has got Talent”). The boys provided a 50 minute set and this included the premiere of 2 new songs recently written by the band. 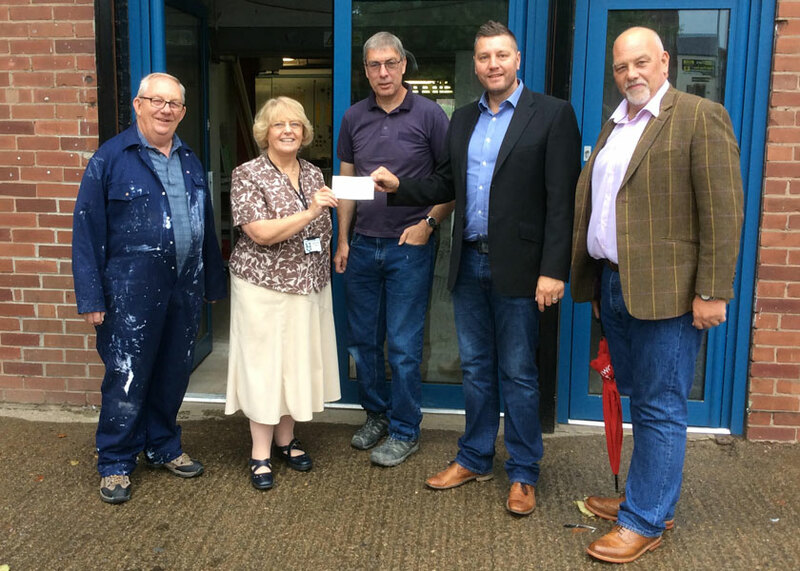 As well as mill tours, which help to raise invaluable funds for Castleford Heritage Trust, the open day included lots of children’s activities, a Bar-B-Q and another outstanding flower, heritage and art exhibition located in most of the mill’s former industrial spaces. Working in partnership with local primary and secondary schools, art groups and the Castleford Flower Club, the exhibition was once again very well received, and this included a small photography exhibition created by members of the Castleford Heritage Young People’s (CHYP’s) group. The next open day at Queen’s Mill is on Saturday 29th November 2014, from 10:00 - 15:00. On Friday 8th August our Chair, Alison Drake MBE, was invited by Network Rail and the Henry Moore Foundation to the unveiling of the first piece of public art to be exhibited at King’s Cross Square, the new public square in front of the redeveloped King’s Cross station. The Spindle Piece has been loaned to Network Rail to display at King’s Cross, serving as a gateway to the Henry Moore Foundation in Hertfordshire and the Henry Moore Institute in Yorkshire, both of which are accessible by train from King’s Cross station. Also attending the ceremony on behalf of Castleford Heritage Trust were Renato Benedetti and Ketan Lad of architects McDowell+Benedetti who have developed the plans for the future shape of Queen's Mill. Alison was introduced to sculptor Sir Anthony Gormley, who was interested in our plans to tell the story of Castleford’s most famous son, Henry Moore. He commented "As the birthplace of Henry Moore, Castleford offers a unique location from which to explore the early life of Moore, his personal development from child to adult and how these early years influenced the internationally significant artist that he became." After the ceremony Sir Anthony Gormley introduced Alison to Richard Calvocoressi, Director of the Henry Moore Foundation, who was very supportive of the project to convert the Queen’s Mill into an Arts and Heritage destination. 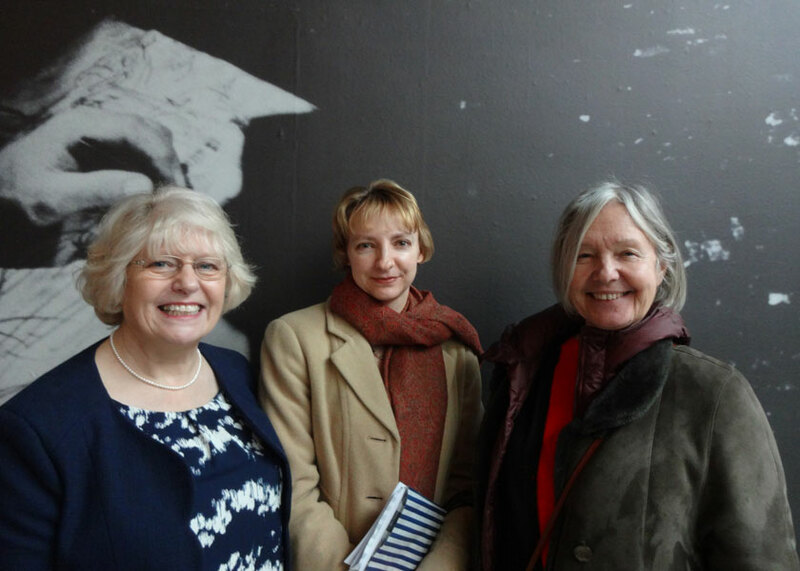 Alison says "It was wonderful to attend the event at King’s Cross and meet the trustees and Director of the Henry Moore Foundation. This was a perfect opportunity to inform them about our project. They were very supportive and some want us to arrange for them to come to Castleford to find out more about Queen’s Mill and Henry Moore’s birthplace. I also enjoyed meeting sculptor Antony Gormley who was very interested in our plans for a sculpture gallery in Castleford. Antony already has pieces on display in Castleford so it would be great to think he might add to our town’s sculpture experience." Pictured at the unveiling from left are; Renato Benedetti, Sir Anthony Gormley and Alison Drake MBE. 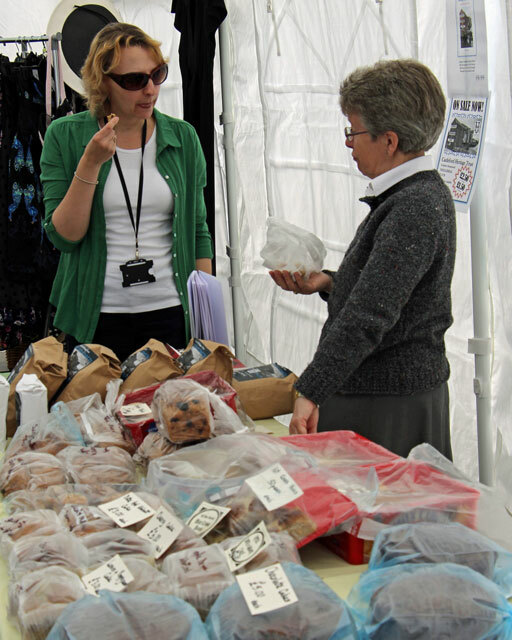 On Saturday 12th and Sunday 13th July 2014 Castleford Heritage Trust held its annual Heritage Festival at Queen’s Mill and there was more than traditional flour-milling displays on show to the public. Held over 2 days, hundreds of people attended the festival which included spectacular flower and heritage displays created by the Castleford Flower Club, as well as an art exhibition. Not all the pictures are available on this device. 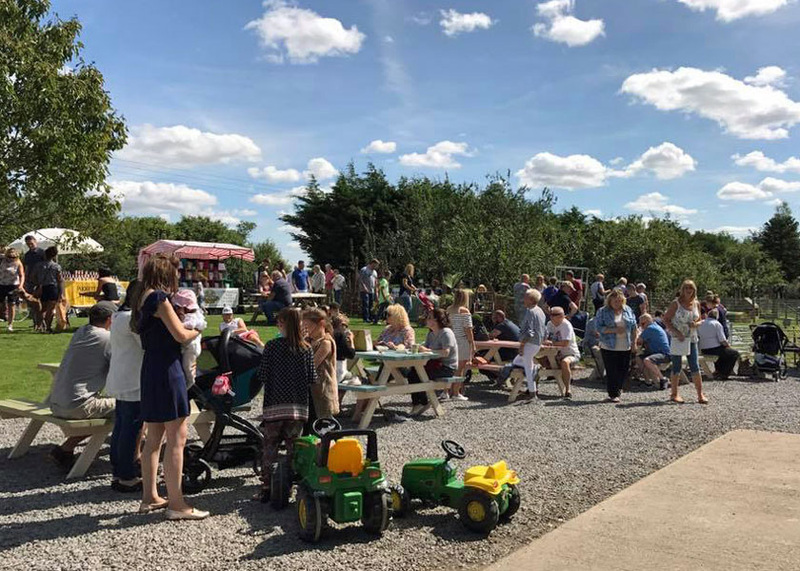 The heritage festival included the open day with live music, mill tours, children’s activities, craft stalls and Bar-B-Q on Saturday and a vintage tea party on Sunday. Mill tours also included traditional flour-milling demonstrations and the presentation of plans and the latest information about the mill’s future redevelopments. Inspired by Castleford’s cultural and industrial heritage, a range of flower displays were included depicting Henry Moore, the brickworks, pottery and glass making, the Castleford Tigers, the new footbridge and many more. The festival also celebrated the talent and creativity of the town’s youngest artists with over 100 pictures exhibited in the mill from 6 local primary schools, as well as both Castleford Academy and Airedale Academy. Children’s activities at the open day included lots of creative fun including sand-art, plant pot and bun decorating, competitions and other games. Special guests at the open day included JT, Tigers Mascot and Castleford Fire Brigade. Even JT got in on the fun and gave the event the thumbs up. Daniel Messruther, JT, Leah and Georgie Burgess get creative. The colouring-in competition was won by Kennedy Pennington (right), aged 7, from Castleford Half Acres Primary School. Kennedy is pictured below at the festival with sister Maddison and mum Julie, along with her winning entry. Kennedy won lots of art and activity resources worth over £10.00. The live music was provided by singers and musicians from Castleford Academy, as well as local band The Memphis Cruisers. The Castleford Academy pupils received much acclaim from the audience and they sang a number of popular songs, including some by Dolly Parton, who recently headlined at Glastonbury. The Memphis Cruisers, who have performed at previous open days delivered another amazing set in the afternoon, much to the delight of visitors. Year 10 Castleford Academy performers: Niamh Raven, Courtney Cranton and Jess Edwards. On Wednesday 28th May the Trust launched its latest initiative CRiSP, the Castleford Rivers Stewardship Project with a trip along the local waterways in a narrowboat belonging to the Safe Anchor Trust. The project run in partnership with the Environment Agency, aims to help maintain and improve the heritage and natural environment of the waterways through volunteering, training and employment opportunities. Representatives from various local businesses attended the launch event and it is intended that training for the project will be based at Queen’s Mill, which is owned by the Trust. The first phase of the work is planned for the river from Castleford Lock to the weir where the banks will be cleared and the fishermen's platforms will be restored. The Trust webmaster John Parker commented, "One of my jobs in the 1970s was maintaining the anti-foam pumps which were located at the back of the mill. In those days the River Aire was heavily polluted and devoid of any aquatic life. 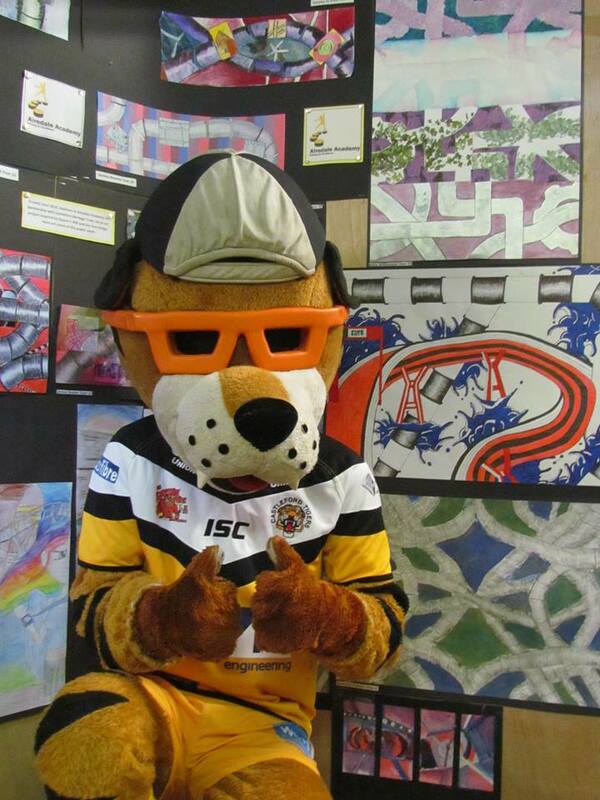 The work being done by the CRiSP initiative will give Castleford an amenity to be proud of." A hot sunny day and the prospect of free boat rides ensured a bumper attendance at the fourteenth annual Castleford Canal Festival on Saturday May 17th. The event is a joint venture organised by Castleford Heritage Trust, hosted by The Canal and River Trust with the boat rides being run by The Safe Anchor Trust a charitable organisation from Mirfield. Safe Anchor visit Castleford Lock every May and stay for ten days, during this time they offer free boat rides to local school children and community groups. 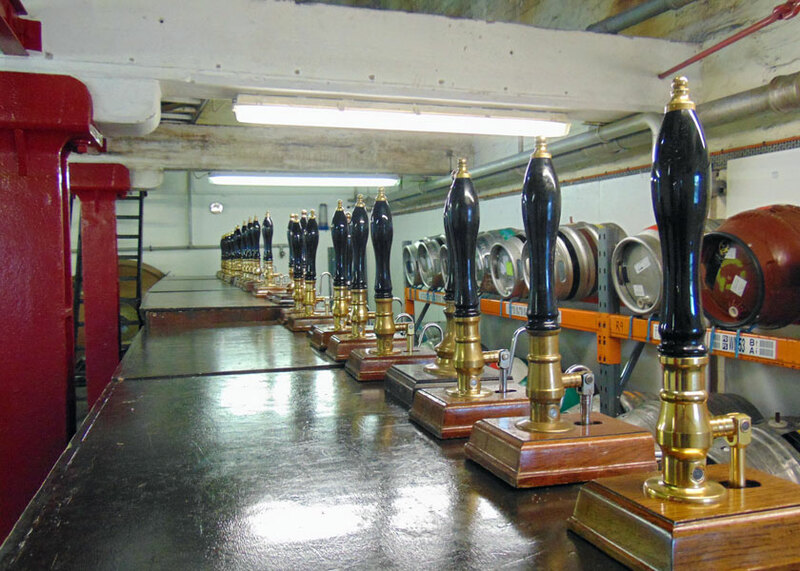 During the day the mill was open for car parking, guided tours and drinks. 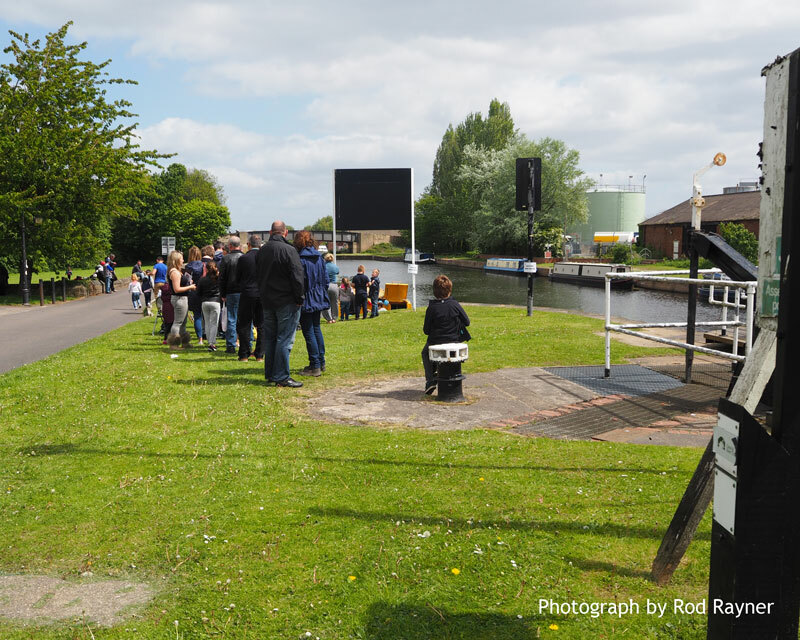 Meanwhile at the lock the crowds had the opportunity to buy burgers and ice creams and also browse around the craft stalls being operated by the volunteers. One visitor Roy Batty of Wakefield said: "It's been a fantastic day out for the family we've really enjoyed ourselves, we'll be telling our friends all about it so they can come next year." 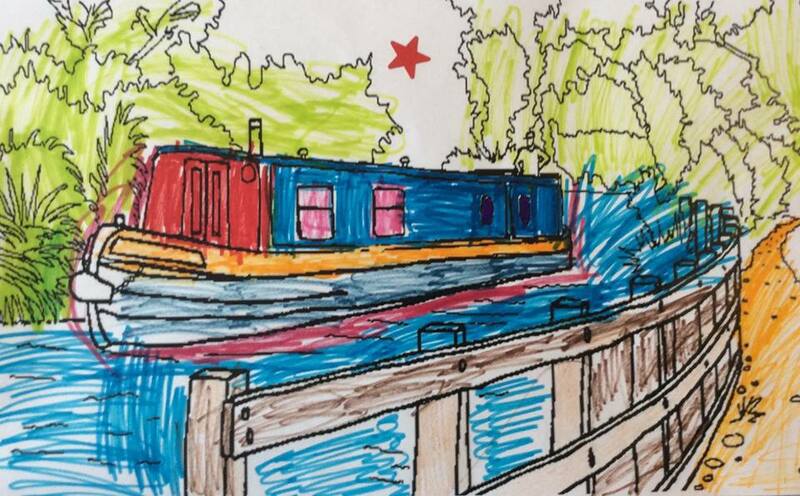 The Canal Festival included the ‘Wild Zone’ with a range of activities aimed at children and young people including a wildlife spotter sheet with free prize draw, a colouring-in competition, children’s tombola and ‘guess the name of the doll’. More than 50 children took part in the wildlife spotter activity and 50 children entered the colouring-in competition. Feedback on the day from both children and parents was very positive and the competition winners are below. 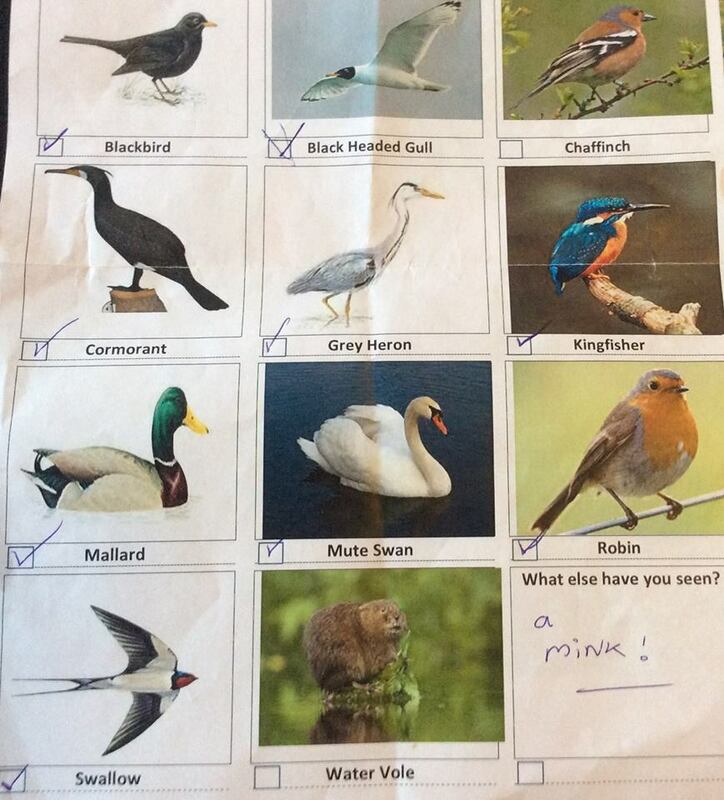 Louie Smith (Aged 9) from Three Lane Ends Community Primary School won the wildlife spotter sheet prize draw. The prize winning pictures are shown below. On Saturday May 3rd over 800 people attended an open day at Queen's Mill which not only raised money for the Trust but also made visitors aware of the scale of the planned renovations for the site. The Trust Chair, Alison Drake said: "It was a wonderful success. We were amazed by the number of people that turned up. We had more than 200 people on guided tours around the mill. and everyone seemed pleased with our plans. I think it shows the town are staying with us in terms of what we want to do and that means an awful lot to us." The Trust hopes to open the mill as a museum and arts centre complete with a site revamp and café by 2017. 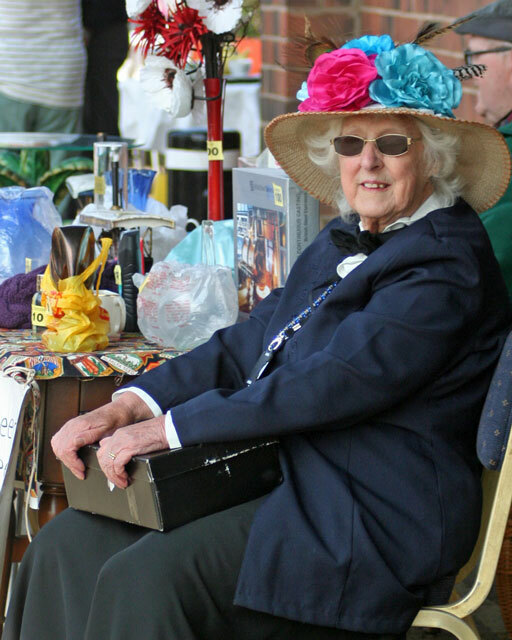 Over the Easter period Joan Prewer helped in raising money by holding a tombola in Castleford town centre. Joan dressed as the Easter Bunny was assisted by husband Gavin, Reg Lavine the Town Crier and members of the Heritage Group. On the day they raised over £200 for the Queen's Mill project. Following the theft of the Gilligan's Roundabout Horses the police have advised us to publicise the fact as this is the best way to recover the artefacts. This theft is now registered on the national police data base as missing artefacts and antiquities. If you have any information that will help in the recovery of the roundabout please contact the Trust on 01977 556741 or Castleford Police on 01924 206210. On the evening of Saturday April 5th the Trust held a race night hosted by the Lock Lane Residents Group to raise funds. Over fifty people attended the event and were treated to a night of racing with the added bonus of a pie and pea supper. We would like to thank Wendy and Rod Rayner and their team of volunteers from The Trust who raised over £500. The first week in April had two items of note. Firstly on Wednesday 2nd a Blue Plaque issued by English Heritage was placed at Henry Moore's birthplace on Roundhill Road. The plaques themselves are permanent signs installed in publicly visible locations on buildings to commemorate famous people who lived, worked or were born there. The ceremony was attended by civic dignitaries, local school children and members of the public. The following day Thursday 3rd gave members of the Trust the opportunity to have a guided tour of Castleford's Forum Museum. The second floor of the public library on Carlton Street houses exhibitions of the area's rich history and has five permanent displays which feature the life and work of Henry Moore, the town's Roman past and the industries of mining, pottery and glass which helped to shape the town. Tuesday 18th February saw the opening of our newly refurbished Café & Visitor Information Centre. It is open from 10:00 'til 13:00 and features a new menu so why not come along. We also have a range of information leaflets about the Wakefield District and wider region. Café opening hours: 10am – 1pm on Tuesdays and Thursdays. Our café is run by volunteers and we are always looking for more help. Tuesday 18th also saw a delegation present a petition signed by over a thousand concerned residents to Wakefield District Council, the residents are objecting to the sighting of a proposed waste incinerator between Wheldon Road and Healdfield Road . Chair of the Trust Alison Drake commented, "I object to these plans on all counts. They would be highly detrimental and the entire town would be affected." The protesters fear the planned facility could increase pollution and cause traffic chaos. The campaigners subsequently held a public meeting about the plans at Trinity Methodist Church, Powell Street, Castleford, on Monday, February 24th. Concerned residents and their petition. 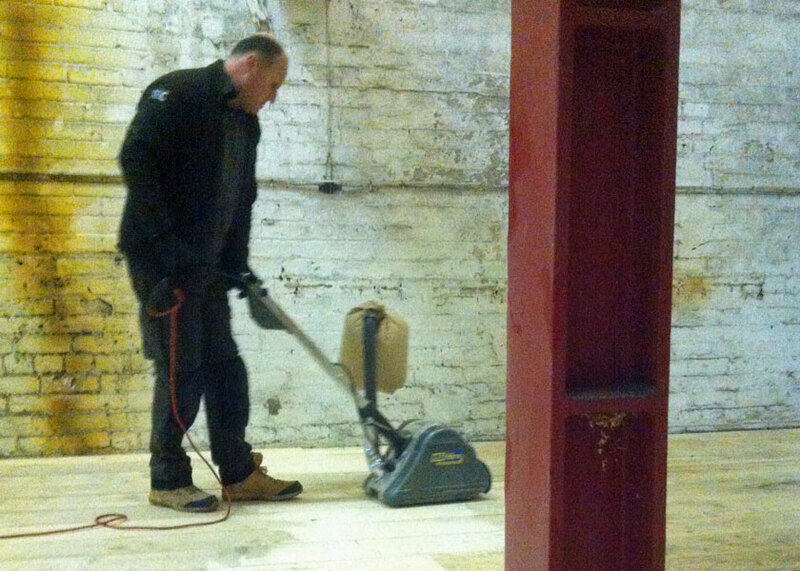 December saw two landmark events take place in our plans to improve Queen's Mill. On Friday the 13th Jonathan Tinsley of the Canals and River Trust handed over their history of the mill to Yvette Cooper MP. Then on Saturday the 14th the new Café and Tourist Information Centre was officially opened by Denise Jeffery the Deputy Leader of Wakefield Council.